The heat shock response is a universal homeostatic cell autonomous reaction of organisms to cope with adverse environmental conditions. In mammalian cells, this response is mediated by the heat shock transcription factor Hsf1, which is monomeric in unstressed cells and upon activation trimerizes, and binds to promoters of heat shock genes. To understand the basic principle of Hsf1 activation we analyzed temperature-induced alterations in the conformational dynamics of Hsf1 by hydrogen exchange mass spectrometry. We found a temperature-dependent unfolding of Hsf1 in the regulatory region happening concomitant to tighter packing in the trimerization region. The transition to the active DNA binding-competent state occurred highly cooperative and was concentration dependent. Surprisingly, Hsp90, known to inhibit Hsf1 activation, lowered the midpoint temperature of trimerization and reduced cooperativity of the process thus widening the response window. Based on our data we propose a kinetic model of Hsf1 trimerization. Cells cope with excessive heat, toxic compounds and other adverse environmental conditions by triggering an internal repair process called the heat shock response. In mammalian cells, a protein called Hsf1 is activated by stress and regulates the activity of a large set of target genes. These genes code for proteins that help the cell cope with the effects of stress, for example, by repairing or breaking down damaged proteins. Under normal conditions, Hsf1 exists as a single molecule, but when it is activated, three molecules come together to make a complex called a trimer that is able to bind to DNA and activate the target genes. Proteins are made of long chains that then fold into specific three-dimensional shapes. It is not known how Hsf1 is kept in an inactive state in healthy, unstressed cells. One possibility is that the protein folds into a three-dimensional shape that prevents it from being activated. Alternatively, Hsf1 may be bound to other proteins called chaperones that move away when the cell is under stress because they are needed to help the damaged proteins refold into their own three-dimensional shapes. Hentze et al. used a variety of biochemical techniques to study the human Hsf1 protein. The experiments showed that there are two regions of the Hsf1 protein that changed shape dramatically when the temperature increased. A region that regulates the activity of Hsf1 unfolded, while a region involved in making the trimer became more stable. Detailed analysis showed that once the regulatory region unfolded, the protein was able to interact with other Hsf1 units to make the trimer. Therefore, Hsf1 can directly sense and respond to changes in temperature without the aid of any chaperone proteins. Further experiments showed that the formation of Hsf1 trimers and the ability of these trimers to bind to DNA depend upon both the temperature and the amount of Hsf1 present. In addition, a chaperone protein called Hsp90 – which is known to be able to interact with Hsf1 – influenced how Hsf1 responded to changes in temperature. Hentze et al. also present a model for the activation of Hsf1 that allows for flexibility in the response of Hsf1 to changes in temperature. Previous studies have shown that Hsf1 is chemically modified during stress and also while the cell recovers from stressful conditions. Therefore, the next challenge will be to find out how these modifications influence the way in which Hsf1 responds to stress. To cope with changes in physical and chemical properties of the environment as well as with physiological and pathophysiological conditions which cause protein misfolding, organisms mount a homeostatic transcriptional program, the so-called heat shock response (Jolly and Morimoto, 2000). In all eukaryotic cells, heat shock transcription factor (HSF) 1 is the master regulator of this response and alters transcription of a large number of genes, some of which encode chaperones and proteases (Anckar and Sistonen, 2011). Although this response is essentially cell autonomous, systemic modulation of this response has been observed in metazoa (Morimoto, 2008; Prahlad et al., 2008; Prahlad and Morimoto, 2011). Metazoan Hsf1 consists of a N-terminal winged helix-turn-helix DNA binding domain (Harrison et al., 1994; Vuister et al., 1994), a hydrophobic shorter heptad repeat regions (HR-A/B) proposed to function as a leucine zipper coiled-coil trimerization domain (Clos et al., 1990; Rabindran et al., 1993), a regulatory domain, a second heptad repeat (HR-C) and a C-terminal transcription activation domain (Figure 1A) (Anckar and Sistonen, 2011; Voellmy, 2004). In unstressed cells metazoan Hsf1 is monomeric and supposed to be in complex with molecular chaperones, including Hsp70, Hsp90 and TRiC/CCT (Shi et al., 1998; Zou et al., 1998; Neef et al., 2014). At physiological concentrations monomeric Hsf1 does not bind appreciably to heat shock elements (nGAAn). In the activated state Hsf1 forms trimers or higher order oligomers and binds to its response elements in heat shock gene promoters (Clos et al., 1990; Rabindran et al., 1993). Currently, two models are discussed for the heat-induced activation of Hsf1: (1) Based on the observation that deletion or mutational alteration of HR-C leads to constitutive trimerization Wu and co-workers proposed that Hsf1 is a thermosensor itself and kept monomeric by intramolecular leucine zipper formation (Rabindran et al., 1993). However, activation of human Hsf1 in human and insect cells and Xenopus oocytes occurs at different temperatures, arguing against an Hsf1 intrinsic mechanism of heat shock activation (Baler et al., 1993; Clos et al., 1993). (2) Owing to the fact that the large variety of Hsf1-inducing signals have in common to cause protein misfolding and in analogy to the regulation of the heat shock response in E. coli (Guisbert et al., 2008), chaperones were proposed to prevent Hsf1 activation and to be titrated away from Hsf1 under stress conditions, resulting in heat shock response induction (Morimoto, 1998). Consistent with this hypothesis is the observation that inhibition of Hsp70, Hsp90 or TRiC/CCT or knock-down of their expression leads to the induction of the heat shock response (Powers and Workman, 2007; Powers et al., 2008; Neef et al., 2014; Whitesell et al., 2003; Lee et al., 2013; Abravaya et al., 1992; Zou et al., 1998). Recombinant purified human Hsf1 is largely monomeric and trimerizes and acquires DNA binding competence upon heat shock. (A) Domain organization of human Hsf1 [modified from Anckar and Sistonen (2011)]. (B) Size exclusion chromatography separates recombinant human Hsf1 in monomer, dimer and trimer/oligomer as indicated. (C) Blue native gel of the three peak indicated in panel B (monomer and dimer), monomeric Hsf1 after 10 min heat shock at 42°C (monomer HS); and trimeric/oligomeric Hsf1 purified under denaturing conditions and refolded into a DNA binding competent state (M, monomer; D, dimer; T, trimer; HO, higher order oligomers). (D) Electrophoretic mobility shift assay (EMSA). Monomeric Hsf1 (Hsf1m), monomeric Hsf1 treated for 10 min at 42°C (HS), or trimeric Hsf1 (Hsf1t) were incubated with fluorescent labeled HSE-DNA minus or plus unlabeled HSE-DNA and separated on a native agarose gel. Lane 1, HSE-DNA in the absence of protein. (E) Amide hydrogen exchange of monomeric Hsf1 after 30 s at 20°C in D2O buffer. Exchange was correct for back exchange using a fully deuterated Hsf1 preparation. Error bars are the standard error of mean (SEM) of three independent experiments. (F) Cartoon representation of the DNA binding (PDB ID 2LDU) and trimerization domains of human Hsf1 colored according to deuteron incorporation as indicated. Gray, no sequence coverage. The trimerization domain is a homology model of the HR-A/B region (residues 130–203) of human HSF1 on the structure of Chaetomium thermophilum Skn7 [PDB ID 5D5Z, (Neudegger et al., 2016) using I-TASSER (Zhang, 2008; Yang and Zhang, 2015; Yang et al., 2015; Roy et al., 2010)]. Further regulation of Hsf1 is provided by posttranslational modifications, including phosphorylation, acetylation, sumoylation and oxidation of cysteines to disulfide bridges (Hietakangas et al., 2003; 2006; Sarge et al., 1993; Westerheide et al., 2009; Brunet Simioni et al., 2009; Zhong et al., 1998; Lu et al., 2008). The contribution of these modifications to the primary activating mechanism are still unclear (Budzyński et al., 2015). To resolve the molecular mechanism of the temperature-induced activation of Hsf1 we analyzed the conformational dynamics of purified monomeric human Hsf1 pretreated at different temperatures using hydrogen-1H/2H-exchange (HX) mass spectrometry (MS). We found temperature-dependent unfolding of HR-C and concomitant stabilization of HR-A/B, demonstrating that isolated Hsf1 acts as temperature sensor. At short incubation times the temperature response curve exhibits high cooperativity with a transition midpoint of 36°C. Using fluorescence anisotropy we demonstrate that the acquisition of DNA-binding competency depends on temperature and concentration of Hsf1. Phosphomimetic Hsf1 variants corresponding to phosphorylation at two serine residues previously shown to negatively affect Hsf1 activation did not have an increased temperature transition midpoint. Hsp90 known to negatively regulate Hsf1-mediated transcription decreased the slope of the temperature response curve, thereby lowering the transition midpoint and widening the response window. Our data suggest a kinetic model of Hsf1 trimerization. Recombinant human Hsf1 was purified out of E. coli by affinity chromatography and size-exclusion chromatography, resulting in mostly monomeric species in the final fraction (Figure 1B and C). Upon incubation at 42°C, Hsf1 formed trimers and higher-order oligomers, as verified by blue native gel electrophoresis consistent with published data (Clos et al., 1990), and acquired DNA-binding competence as shown by electrophoretic mobility shift assays (Figure 1C and D). 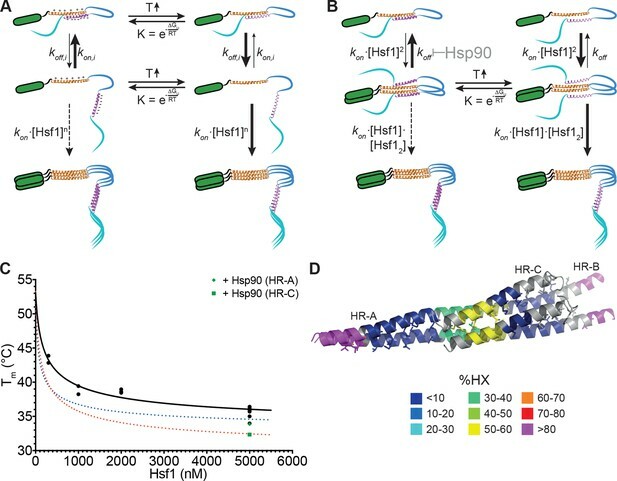 The conformational dynamics of Hsf1 was investigated by HX-MS as described previously (Rist et al., 2006; Graf et al., 2009). Monomeric Hsf1 was incubated for 30 s in D2O at 20°C, subsequently mixed with ice-cold, low-pH quench buffer to slow down back exchange, and analyzed on our HPLC-mass spectrometry setup including a column with immobilized pepsin for online digestion. As shown in Figure 1E, monomeric Hsf1 is highly dynamic with only few regions exhibiting significant protection from HX, including parts of the DNA binding domain and the trimerization domain (HR-A/B). Out of the C-terminal half of the protein, containing the regulatory region, HR-C and the transactivation domain, only the HR-C region showed significant protection at 20°C consistent with an earlier study showing the C-terminal half of Hsf1 largely unfolded (Pattaramanon et al., 2007). Figure 1F shows a heat map of the DNA binding domain and the trimerization domain of Hsf1, the only parts for which structural information is available. To elucidate temperature-induced changes in conformational dynamics, we pre-incubated monomeric Hsf1 at different temperatures for different time intervals followed by incubation at constant temperature in D2O (Figure 2A). As control, we analyzed the pre-treated Hsf1 by blue native polyacrylamide gel electrophoresis (Wittig et al., 2006) and observed a temperature-dependent increase in trimeric Hsf1 species (Figure 2B and Figure 2—figure supplement 1). 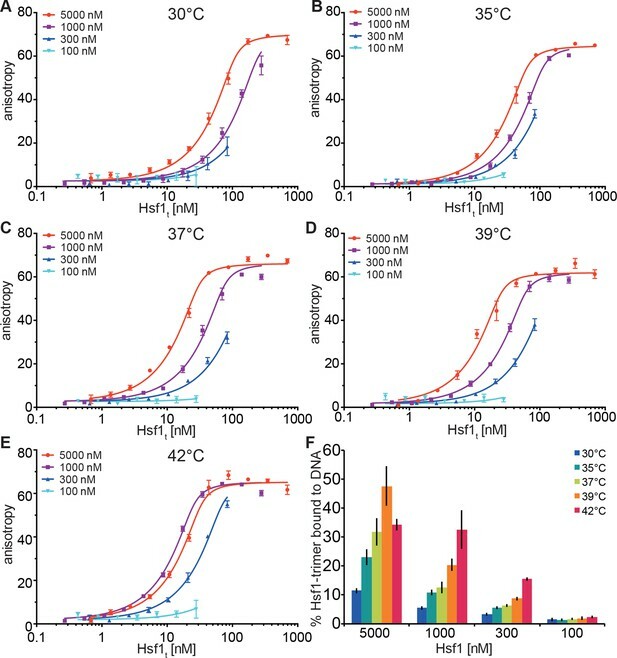 The 10 min-pre-incubation of Hsf1 dramatically changed conformational dynamics of two regions in Hsf1 (Figure 2): temperature-dependent increase in HX is observed in HR-C, indicating heat-induced unfolding, and a concomitant decrease in HX is observed in HR-A/B, consistent with heat-induced trimerization. Close inspection of the spectra of the peptic fragments exhibiting temperature-induced changes in HX revealed bimodal distributions of the isotope clusters indicative of the coexistence of two populations of molecules with different exchange properties (Figure 2—figure supplement 2A and C, Figure 2—figure supplement 3). An equation for two Gaussian curves was fitted to the intensity-versus-m/z plots of the data (Figure 2D and F, and Figure 2—figure supplement 2B and D, Figure 2—figure supplement 3) and the equation parameters used to back calculate the contribution of each population to the peak intensities (see Figure 2—figure supplement 2). For the HR-A/B region the relative frequency of high exchanging population decreases with pre-incubation at increasing temperatures resulting in a sigmoidal temperature response curve (Figure 2E). For the HR-C region the opposite is observed: the frequency of high exchanging species increased with increasing temperatures (Figure 2G). These data clearly demonstrate that Hsf1 has intrinsic thermosensory properties. The midpoint of transition Tm, the temperature at which 50% of the molecules are in the high exchanging conformation after 10 min, was identical for both regions equal to 36.15 ± 0.14°C. Human Hsf1 is a thermosensor. (A) Experimental design: monomeric human Hsf1 was pre-incubated at different temperature as indicated for 10 min or 30 min and then either analyzed by blue native polyacrylamide gel electrophoresis (BN) or diluted 20-fold into D2O-buffer at 20°C and incubated for 30 s. The reaction was quenched and the samples analyzed by HPLC-MS. (B) Analysis of quaternary structure of Hsf1 after pre-incubation at different temperatures for 10 min as indicated. Hsf1 was detected by immunoblotting with an Hsf1 specific antiserum. M, monomer; D, dimer; T, trimer. (C) Difference plot of deuteron incorporation into monomeric Hsf1 pre-incubated at the indicated temperature minus deuteron incorporation of Hsf1 pre-incubated at 20°C for peptic peptides as indicated. Error bars are SEM of three independent experiments. Cartoons underneath the X-axis indicate the domains of Hsf1 corresponding to the respective peptic peptides and a homology model of the trimerized human HSF1 (kindly provided by A. Bracher [Neudegger et al., 2016]), colored according to HX as indicated. First and last amino acid of the model are indicated. (D, F) Intensity distributions of the isotope clusters of peptide 1155.581+ corresponding to amino acids 159–168 (D) and 765.301+ corresponding to amino acids 389–395 (F) for different pre-incubation temperatures, as indicated. Curves are fits of the sum of two Gaussian peak functions to the data (see Figure 2—figure supplement 2). Representative plot of three independent experiments. (E, G) Fraction of high-exchanging species calculated, as described in Figure 2—figure supplement 2. Data points for three independent experiments with 10-min (dark blue) and 30-min (light blue) pre-incubation time at elevated temperatures are shown for peptide 159–168 (E) and 389–395 (G). The curve is a fit of a thermal unfolding equilibrium to the data. Data for additional peptides are shown in Figure 2—figure supplement 3. We also determined the midpoint of transition for 30 min pre-incubation at different temperatures (Figure 2, Figure 2—figure supplement 3). Under these prolonged incubation conditions, the transition curves became more shallow, and the midpoint temperature for HR-C unfolding and HR-A protection (trimerization) was not identical anymore but decreased to 32.0 ± 0.4 and 34.7 ± 0.2°C, respectively. These data suggest that the temperature-induced conformational changes are not reversible under our conditions, otherwise the steepness of the curves, which is determined by the unfolding enthalpy, should remain the same as for the 10-min-pre-incubation. To investigate this in more detail we heat-shocked Hsf1 for 10 min at 42°C, then incubated the protein for different time intervals at 20°C, and analyzed the conformational state by HX-MS (Figure 3). As control, we incubated Hsf1 without prior heat shock for 30 min at 20°C before HX-MS analysis. We also tested whether dilution would lead to trimer dissociation in the time scale of our experiments (Figure 3G). Both assays clearly demonstrate that HR-C unfolding, HR-A protection and Hsf1 trimerization are not reversible under these conditions. Therefore, we cannot derive the unfolding enthalpy ∆HU from our temperature response data but only use the fit to determine the temperature at which 50% of the transition occurred. Heat-induced trimerization of Hsf1 is not reversible. (A–F) Prolonged incubation at 20°C does not revert the heat shock induced changes in Hsf1 conformation. Hsf1 (5 µM) was incubated for 10 min at 42°C and then shifted to 20°C. Aliquots were diluted at different time points (0, 3, 10, 30, 100 min) for 30 s into D2O buffer and subsequently analyzed by LC-MS. As control, Hsf1 was not heat-shocked and incubated for 30 min at 20°C before dilution into D2O. Shown are the intensity-m/z data for the indicated peptides from HR-A region (A, aa 159–168, 578.292+; C, aa 169–175, 430.742+) and region HR-C (E, aa 389–395, 765.311+) with a global fit of an equation for two Gaussian peaks, as in Figure 2. The percentage of high exchanging species was calculated as described in Figure 2—figure supplement 2 (B, D, F). Data for two independent experiments are shown. (G) Dilution of heat-shocked Hsf1 does not lead to trimer dissociation. Hsf1 (5 µM) was heat-shocked at 42°C for 10 min, subsequently diluted as indicated, incubated at room temperature for 15 min, analyzed by blue-native gel electrophoresis, and detected by immune blotting with an human Hsf1 specific antiserum (lanes 1–7). Control samples were kept on ice before dilution and incubation at room temperature (lanes 8–14). M, monomer; T, trimer; HO, higher order oligomers (not detectable anymore upon dilution). To resolve the kinetics of the conformational transitions, we pre-incubated monomeric Hsf1 for 10-1000 s at 35, 37, 39 or 42°C before diluting into D2O and incubation for 30 s at 20°C (Figure 4). For the peptic fragments of HR-C (amino acids 378–395 and 389–395) the low-exchanging population decrease with a rate of 0.0028 ± 0.0002, 0.0038 ± 0.0002, 0.011 ± 0.001, and 0.018 ± 0.001 s-1 at 35, 37, 39 and 42°C, respectively. For the peptic fragments of HR-A/B (amino acids 159–168 and 169–175) the low-exchanging population increased with slightly lower rates of 0.0018 ± 0.0004, 0.0033 ± 0.0002, 0.0094 ± 0.0009 and 0.016 ± 0.001 s-1 (Figure 4G). The Arrhenius plot of the data yielded the activation energy for the temperature transition of 249 ± 47 kJ·mol-1 (Figure 4H). Taken together, our data demonstrate that Hsf1 is a thermosensor that directly senses increasing temperatures with conformational changes in HR-A/B and HR-C.
Kinetics of heat-induced conformational transitions in human Hsf1. (A–D) Intensity distributions of the isotope clusters for peptide 678.323+ (aa 378–395) and 1155.581+ (aa 159–168) of Hsf1 incubated at 35°C (A and B) or 42°C (C and D) for 10 to 1000 s. Curves are fits of the sum of two Gaussian peak functions to the data. (E and F) Change in the fraction of low exchanging species for peptides 378–395 (E) and 159–168 (F) for 35, 37, 39 and 42°C, as indicated. Curves are fits of a single exponential equation to the data. (G) Transition rates determined by fits as in panels E and F for all four peptides (159–168, 169–175, 378–395, 389–395) evaluated. (H) Arrhenius plot of the data shown in G. Linear regression analysis yielded an activation energy of 258 ± 25, 273 ± 26, 239 ± 19, and 225 ± 22 kJ·mol-1 for peptides 159–168, 169–175, 378–395, and 389–395, respectively. Error bars are SEM of three independent experiments. To uncouple the temperature-induced HR-C unfolding from trimerization, we replaced the hydrophobic heptad repeat residues in HR-A by serine, which should not engage in coiled-coil interactions. HR-A and HR-B are thought to be involved in trimerization, and HR-B had been previously been implicated in negative regulation of trimerization, since deletion of HR-B lead to continuous active trimeric HSF1 (Zuo et al., 1994). HX-MS experiments with the mutant protein revealed that HR-A/B and HR-C are constitutively unfolded at all temperatures tested (Figure 5). These results demonstrate that the ability of HR-A to form a coiled-coil is essential for stabilization of HR-A, HR-B and HR-C, suggesting that HR-C also interacts with HR-A. Hydrophobic residues in HR-A are essential for stability of HR-A and HR-C at all temperatures. (A–D) HX-MS analysis of Hsf1-I130S,V137S,L140S,V144S,M147S,M154S, L158S,M161S,L168S,V172S,L175S (Hsf1-HR-A-S11). Mutant protein was incubated at the different temperatures for 10 min and then analyzed by HX-MS. Shown are peptides from HR-A/B (A, aa 147–169, 634.804+; B, aa 170–189, 465.265+) and HR-C (C, aa 380–388, 535.762+; D, aa 389–395, 765.311+). For all peptides, the 100% deuterated control is shown and for the HR-C peptides a wild-type control, which was incubated for 30 min at 20°C to emphasize the decreased stability of the mutant protein. For the peptides from HR-A, no wild-type control peptides could be shown due to different sequence and cleavage by pepsin. Shown is one of three experiments with identical results. In our in vitro experiments, the midpoint of trimerization of Hsf1 was around 36°C, which seemed rather low given a body core temperature of 37°C, and DNA binding activity of Hsf1 in different human cells is rather low below 40°C and strongly increased above 42°C (Abravaya et al., 1991; Mosser et al., 1990; Baler et al., 1993). In contrast, in testis the major increase in DNA binding activity of Hsf1 is already observed at 38°C (Sarge, 1995; Sarge et al., 1995). Therefore, the above described unfolding of HR-C cannot be the sole determinant for the setpoint of Hsf1 trimerization and DNA binding activity. Trimerization as multi-molecular reaction would be intrinsically concentration dependent. In contrast, inhibition of trimerization by coiled-coil interaction of HR-C with HR-A/B, as originally proposed by Wu and colleagues (Rabindran et al., 1993), would be an intramolecular reaction and consequently independent of concentration. Thus, the concentration of Hsf1 could be an important parameter for controlling the setpoint of the temperature response curve. Consistent with this hypothesis we noticed spontaneous trimerization of Hsf1 even at 4°C upon concentrating the protein. To explore this hypothesis more quantitatively, we devised a fluorescence anisotropy assay to determine the fraction of Hsf1 capable of binding DNA after treatment at different temperatures. We treated different concentrations of Hsf1 at 30, 35, 37, 39, and 42°C for 10 min, serially diluted the samples, incubated them with fluorescent labeled double-stranded DNA containing heat shock elements and measured fluorescence anisotropy (Figure 6). None of the formed Hsf1 trimers dissociated upon dilution and incubation at room temperature (Figure 3G). If Hsf1 trimerization were not concentration dependent in the concentration range tested, all data points would fall onto the same titration curve. This was obviously not the case. The quadratic solution of the binding equilibrium, modified for fractional active protein was globally fitted to the data, assuming identical KD values for all formed Hsf1 trimers and similar minimum and maximum anisotropy values for no binding and complete binding, respectively. This fit yielded the fraction of DNA binding competent Hsf1 trimers. For 100 nM Hsf1, no activation was observed up to 42°C (Figure 6F). At 300 nM, less than 20% of the theoretical possible Hsf1 trimers had formed at 42°C within 10 min. In contrast, at 1 and 5 µM concentrations a substantial fraction of Hsf1 trimers had formed already at lower temperatures. At 42°C the apparent fraction of DNA-binding competent Hsf1 species may decrease due to the formation of high order oligomers as observed by blue native gel (Figure 1C). Temperature-induced acquisition of DNA-binding competence of Hsf1 is concentration dependent. (A–E) DNA-binding competence of monomeric Hsf1 after pre-incubation at the indicated temperature as measured by fluorescence anisotropy of 5’-Alexa 488-labeled HSE-DNA (5’ccccTTCccGAAtaTTCcccc3’). Monomeric Hsf1 was pre-incubated at 30-42°C at different concentrations (100–5000 nM) as indicated, then twofold dilution series were prepared and labeled DNA added. Plotted is fluorescence anisotropy (relative values) versus theoretical concentration of Hsf1 trimer. Curves represent a global fit of the quadratic solution of the binding equilibrium modified for fractional activity of Hsf1 to all data together resulting in a KD of 1.10 ± 0.2 nM for fully active trimeric Hsf1 and a fraction of Hsf1 that formed DNA-binding competent trimers as shown in panel (F). Data of one representative experiment is shown. Error bars represent standard error of the mean of four technical replicates. (F) Fraction of Hsf1 that formed DNA-binding competent trimers at the given Hsf1 concentration and temperature as calculated from data in panels A to E. Mean and standard error of the mean of three independent sets of experiments are shown. Since these data indicated that the temperature transition of Hsf1 is concentration dependent, we wondered whether only trimerization is affected or HR-C unfolding as well. We therefore repeated the HX-MS experiments at lower concentration (2 µM). Interestingly, not only trimerization but also unfolding of HR-C was concentration dependent and the differences between the transition temperatures of HR-A/B and HR-C were not statistically significant (Figure 7B). However, the difference in transition temperature between Hsf1 at 5 µM and at 2 µM was highly statistically significant (p<0.0001). We could not test lower concentrations of Hsf1 due to lacking sensitivity in the mass spectrometric detection of the important peptides. Temperature response curve of Hsf1 is concentration dependent. (A) Fraction of high exchanging species of peptides 159–168 and 389–395 for 5 and 2 µM Hsf1 pre-incubated at the respective temperatures and analyzed by HX-MS as in Figure 2. Data points and fits of the unfolding equilibrium equation of one representative of three independent experiments are shown. (B) Calculated midpoint temperature for wild-type Hsf1 (2 and 5 µM) and two phosphomimetic Hsf1 variants (5 µM). For 5 µM wild-type Hsf1 (10-min and 30-min-incubations) each data point represents the average of the Tm values for the two peptides observed in the respective region, which were not significantly different from each other (HR-A: aa 159–168 and 169–175; HR-C: 389–395 and 378–395 or 380–388). For 2 µM wild-type and for 5 µM mutant proteins no statistically significant differences were observed between the Tm values for the different peptides (159–168, 169–175, 378–395, 389–395) within an experiment, each data point represents the average of the Tm values of all evaluated peptides for an independent experiment. In addition to the data points of three to six independent experiments, the mean and standard error of mean is shown. *p<0.05; ***p<0.0005; ****p<0.0001; p-values were determined by Tukey’s multiple comparisons test. Taken together, these data clearly demonstrate that HR-C unfolding, trimerization and the fraction of DNA-competent Hsf1 trimers are a function of temperature and concentration. Human Hsf1 is heavily modified by posttranslational modifications (29 phosphorylation sites, 5 acetylation sites and 1 sumoylation site; www.phosphosite.org). Some of these modifications have been shown to influence Hsf1 activation (Holmberg et al., 2001; Guettouche et al., 2005; Xia et al., 1998; Xia and Voellmy, 1997; Chu et al., 1996; Wang et al., 2006; Soncin et al., 2003; Kim et al., 2005; Hietakangas et al., 2006; Westerheide et al., 2009; Raychaudhuri et al., 2014). Phosphorylation of Ser307 was proposed to negatively regulate the activation of Hsf1, because Hsf1-S307A was constitutively active in vivo (Chu et al., 1996; Xia et al., 1998). In contrast, phosphorylation of the close-by Ser303 had no influence on Hsf1 activation (Xia et al., 1998). Therefore, we constructed phosphomimetic variants of human Hsf1 (S307D and S303D as control) and determined their temperature response curves using HX-MS. The transition temperature for the phosphomimetic variants was slightly but statistically significantly lower than for Hsf1wt, indicating that phosphorylation at these sites does not prevent temperature-induced trimerization and might even aid it at physiological concentrations of Hsf1 (Figure 7B). Several lines of evidence suggested that Hsp90 inhibits Hsf1 activation (Zou et al., 1998) and the current model assumes that Hsp90 binds Hsf1 in the monomeric state in unstressed cells (Anckar and Sistonen, 2011). We therefore studied the effect of human Hsp90β on the conformational dynamics of Hsf1, in particular the temperature response curve (Figure 8A–C). Surprisingly, in the presence of Hsp90 the midpoint of transition was lower than in its absence and the response curve was less steep, stretching the transition window from ~10° in the absence of Hsp90 to ~20°. Interestingly, the midpoint temperature of transition in the presence of Hsp90 was slightly lower for the peptide derived from HR-C than for the HR-A/B peptides (Figure 8G). A significant difference in midpoint temperature for the two regions was never observed in other experiments with 10-min-pre-incubation time but with a 30-min-pre-incubation at the different temperatures (compare Figure 8G with Figure 7B). Hsp90 modulates midpoint and steepness of the temperature response curves of human Hsf1. (A) Difference plot of deuteron incorporation of human Hsf1 in the presence of Hsp90β minus deuteron incorporation into Hsf1 at the indicated temperatures. (B and C) Fraction of high-exchanging species of peptic peptides 169–175 (B) and 389–395 (C) of Hsf1 (5 µM) pre-incubated in the absence (blue) and presence of human Hsp90β (15 µM, red) at the indicated temperature before HX at 20°C for 30 s, quenching with low-pH buffer, peptic digestion, and MS analysis. Data points and fits of the unfolding equilibrium equation for three independent experiments are shown. (D and E Electrophoretic mobility shift assay (EMSA). HSE-DNA binding of monomeric Hsf1 pre-incubated at the indicated temperature in the absence (D) or presence of Hsp90 (E). (F) Quantification of data from panels D and E. Fraction of DNA bound by Hsf1 versus temperature is plotted. Data points and fits of the unfolding equilibrium equation to the data of two independent experiments are shown. (G) Transition midpoints calculated from the fits of panels B, C, and F. Numbers represent p values as determined by Tukey’s multiple comparisons test; ns, not significant. To verify that the effect of Hsp90 on trimerization is not an artifact of HX-MS methodology we performed electrophoretic mobility shift assays under comparable conditions using a fluorescently labeled DNA probe containing heat shock elements (Figure 8D–F). Within the experimental error, the results of the DNA binding assay were identical to those of the HX-MS experiments (Figure 8G). Taken together, our results demonstrate that in an in vitro assay with purified components, Hsp90 neither inhibits Hsf1 trimerization nor its DNA binding but, on the contrary, lowers transition temperature and widens the activation window. In this study we demonstrate that human Hsf1 is a thermosensor. We are the first to show that the HR-C region of Hsf1 unfolds with temperature-dependent rates, resulting in a release of its repressive effect on Hsf1 trimerization and DNA binding. For relatively short heat shocks unfolding of HR-C and trimerization through intermolecular interactions of HR-A/B exhibit the same temperature response curves and follow identical kinetics, suggesting that these are coupled events. For longer heat shocks the cooperativity of the transition is reduced and HR-C unfolding and HR-A/B trimerization seem to uncouple. Most importantly, HR-C unfolding, temperature-induced trimerization and acquisition of DNA-binding competence depends on the concentration of Hsf1. Moreover, Hsp90 significantly modulated the temperature response of Hsf1, reducing midpoint and steepness of the response curve, thus widening the temperature window within which Hsf1 transits from monomer to trimer and low to maximal DNA binding competence. The response curves of Hsf1 in the presence of Hsp90 are similar to the response curves at prolonged incubation time at elevated temperatures. Thus, Hsp90 accelerates the response at intermediate heat shock conditions. Our data with purified human Hsf1 are consistent with previous in vivo and in vitro work (Rabindran et al., 1993; Zhong et al., 1998; Baler et al., 1993; Zuo et al., 1994; 1995; Sarge et al., 1993; Zou et al., 1998), substantiating the hypothesis that Hsf1 trimerization and DNA binding is controlled by HR-C. Most previous work was performed in cellular systems or complex cell extracts and only few studies used purified components. Purified Drosophila Hsf1 was shown to exist in a trimer-monomer equilibrium that was influenced by temperature and oxidative stress (Zhong et al., 1998). However, human HSF1 does not seem to exist in such an equilibrium, as we did not observe dissociation of trimeric human Hsf1 upon dilution and heat-induced trimerization was irreversible in our hands (Figure 3). These data suggest that there are principle differences between Drosophila and human Hsf1. For human Hsf1 we observed striking differences between the temperature response curves of 10 and 30-min-incubation at elevated temperatures. How can these differences be explained? Under our conditions temperature-induced Hsf1 transitions were irreversible. Therefore, at low temperatures even rare unfolding fluctuations of HR-C will eventually lead to trimerization, which will not be observed at short incubation times. Two effects could be responsible for the difference in Tm for HR-A/B and HR-C. At low temperature HR-C dissociation from HR-A/B and re-association might be fast as compared to trimerization. In the free state, HR-C could exist in an unfolding-refolding equilibrium, allowing exchange of protons for deuterons. If refolding is slow in comparison to the intrinsic chemical exchange rate, this would be visible as unfolded species, but HR-C would still refold and reassociate with HR-A/B, repressing trimerization. With increasing temperature unfolding rates would increase, shifting the equilibrium to the completely unfolded state, then allowing HR-A/B trimerization. Alternatively, additional temperature-induced conformational changes in HR-A/B are necessary to allow trimerization and these changes are slow as compared to HR-C unfolding at low temperatures. Phosphorylation of Ser307 was suggested to repress human Hsf1 activation because the Ser307 to Ala replacement caused constitutively active Hsf1 in vivo (Xia et al., 1998). The temperature response curve of the phosphomimetic Hsf1-S307D variant measured by HX-MS showed a slightly reduced midpoint of transition as compared to wild-type Hsf1, suggesting that phosphorylation at this site does not inhibit heat-induced trimerization but might rather favor it and the repressive effect must be at a different level. Our observations are consistent with more recent data on non-phosphorylatable Hsf1 variants which were not constitutively active, casting a doubt on the repressive effect of phosphorylation at this site (Budzyński et al., 2015). 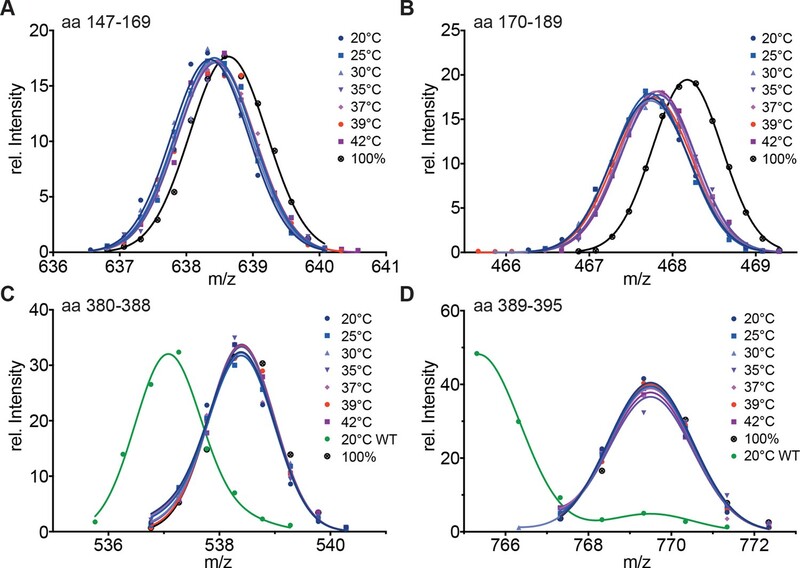 Most surprising was our finding that Hsp90 does not prevent trimerization and DNA binding of Hsf1 but in the contrary reduces midpoint and steepness of the temperature response curve. This observation seems to be at odds with the known repressive function of Hsp90 on the heat shock response (Zou et al., 1998; Whitesell et al., 2003; 2014; Sittler et al., 2001; Ali et al., 1998). This discrepancy may have different reasons. 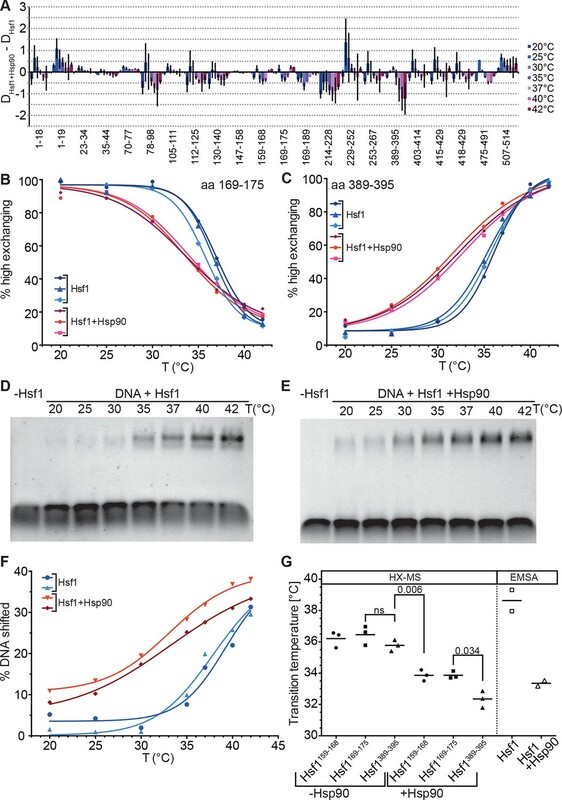 First, Hsp90 also inhibits the heat shock response in yeast, although yeast Hsf1 is constitutively trimeric and bound to DNA, suggesting that Hsp90 could exert its inhibiting function on human Hsf1 after trimerization and DNA binding as well, consistent with observations for human Hsf1 (Duina et al., 1998; Sorger et al., 1987; Guo et al., 2001). Second, in our experiments we only used one isoform of Hsp90, Hsp90β, and did not add any of the some 30 co-chaperones known to assist chaperoning by Hsp90. Further experiments with Hsp90α and different combinations of co-chaperones will be necessary to elucidate whether there exist isoform specificity in Hsf1 regulation or whether Hsp90-co-chaperone complexes have a different effect on Hsf1 trimerization than Hsp90β alone. Third, effects of Hsp90 down-regulation or inhibition could also be indirect, especially because interaction of Hsp90 with Hsf1 seems only to be observed after cross-linking (Neef et al., 2014; Zou et al., 1998), suggesting a very transient interaction. Hsp90 chaperones many kinases, and inhibition of Hsp90 leads to inactivation and degradation of these client proteins. Loss of such kinases could reduce inhibitory effects of phosphorylation or phosphorylation-dependent sumoylation of Hsf1 (Soncin et al., 2003; Wang et al., 2006; Hietakangas et al., 2003; 2006). Originally, it was proposed that HR-C forms a coiled-coil with HR-A or HR-B to prevent trimerization in unstressed HSF1 (Rabindran et al., 1993; Zuo et al., 1994). Together with the observation that Hsf1 spontaneously trimerizes at high concentrations in the absence of a heat shock ([Zhong et al., 1998] and our own observations) and with our HX-MS data, showing temperature-induced unfolding of HR-C, the model shown in Figure 9A can be derived. Under non-stress conditions, HSF1 is in a conformational equilibrium between a closed conformation with HR-C interacting with HR-A/B and an open conformation, in which the two heptad repeat regions are dissociated. Since association of HR-C with HR-A/B is an intramolecular interaction, limiting the diffusional freedom of the interaction partners, association rates would be very high due to the apparent high local concentration. In addition, the net charge of HR-A/B and HR-C are +6 and -7, respectively, favoring association of the two regions by electrostatic attraction. Only at high concentrations of HSF1 association of HR-A/B regions of several HSF1 molecules, which are in the open conformation, would be able to compete with the intramolecular reaction, forming the thermodynamically more stable trimer. This would explain the spontaneous Hsf1 trimerization at high concentrations even at low temperatures (Zhong et al., 1998). Temperature-induced unfolding of HR-C in the closed conformation favors HR-C dissociation. 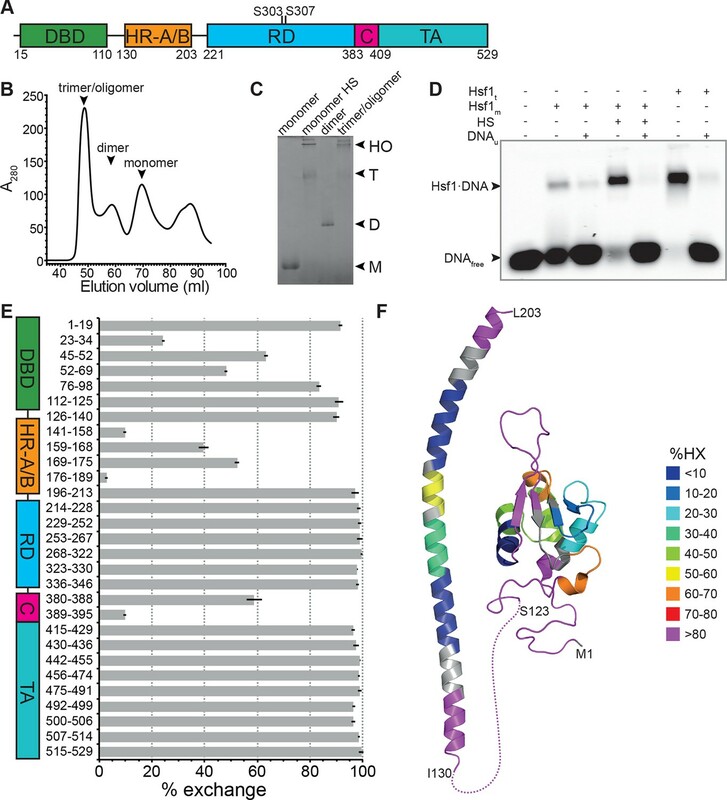 Alternatively or in addition, HR-C unfolding in the open conformation prevents coiled-coil interaction with HR-A/B and thus reduces the back-reaction to the closed conformation. As a consequence, trimer association is favored even at lower HSF1 concentrations. Kinetic models of the thermosensor function of Hsf1. (A) Monomer activation model, based on the originally proposed mechanism modified with our HX-MS data. In unstressed cells monomeric Hsf1 is in equilibrium between a closed, HR-C docked to HR-A/B, and open conformation, with HR-C dissociated from HR-A/B. Owing to high local concentration and electrostatic attraction the intramolecular association rate kon,i of the HR-C–HR-A/B interaction are very high as compared to the dissociation rate koff,i. Since only uncomplexed HR-A/B can trimerize and Hsf1 trimerization therefore depends on the concentration of the open conformation, at low temperatures, trimerization only occurs at high Hsf1 concentrations. Temperature-induced unfolding of HR-C in the docked or undocked state reduces the intramolecular association rates and/or increases the dissociation rate of the intramolecular HR-C–HR-A/B complex, thereby increasing the concentration of Hsf1 in the open conformation and allowing trimerization at low Hsf1 concentrations. (B) Dimer activation model. At low temperatures, HR-C is constitutively docked onto HR-A/B and monomeric Hsf1 transiently dimerizes through the free part of HR-A/B. Such transient dimerization may partially destabilize the HR-C–HR-A/B interaction. At high Hsf1 concentrations a third Hsf1 monomer could interact with a transient Hsf1 dimer to form a thermodynamically stable Hsf1 trimer with completely released HR-C even at low temperatures. Increasing temperatures lead to unfolding of HR-C in the dimeric Hsf1 species leading to stabilization of the Hsf1 dimer and increased probability of trimerization. Hsp90 might modulate the temperature response by stabilizing the dimeric Hsf1 species. (C) Estimation of the concentration dependence of the transition temperature of Hsf1. Data points are all the Tm values determined for 10 min incubation at elevated temperatures for Hsf1 wild type in the absence (black) or presence (green) of Hsp90 by HX-MS and by anisotropy. Black curve is a fit of the quadratic solution of the law of mass action of the monomer-dimer equilibrium, assuming that the fraction of dimer determines the Tm. This fit results in a Tm,M for the monomer of Hsf1 (extrapolation to 0 nM) of 53°C, the Tm,D for the dimer of 33°C, and a KD of the monomer-dimer equilibrium of 330 nM. Due to the sensitivity of the fit to data points at low Hsf1 concentrations, these are only rough estimates. The blue and red dotted lines are simulations using a lower value for KD (100 nM, blue) or KD (200 nM) and Tm,D (29°C, red) to simulate the effect of Hsp90. (D) Tentative model of the dimeric Hsf1 based on the recent crystal structure of the trimerization domain of C. thermophilum Skn7, which formed tetramers in two different crystal forms (PDB ID 5D5Y and 5D5Z, [Neudegger et al., 2016]). HR-A, HR-B and HR-C were homology modeled on the tetrameric Skn7 using I-TASSER (Roy et al., 2010; Zhang, 2008; Yang and Zhang, 2015; Yang et al., 2015). HR-C was positioned to accommodate interactions with HR-A and HR-B. The homology model is colored according to HX-MS data (Figure 1E). Residues of the heptad repeat involved in the tetramer interface are shown as sticks. For two reasons we do not consider this model as very likely: First, single helices free in solutions are usually not stable but are in a rapid equilibrium with the unfolded state due to the low energy difference between helix-internal hydrogen bonds and hydrogen bonds with water. In such a state, we would not expect to see much protection in HX-MS experiments, which is in contrast to our observation (Figure 1E). The amount of heat necessary to unfold a single helix seems too small to account for the temperature control, the steepness, the kinetics and the substantial activation energy of 249 kJ·mol-1 for the unfolding/trimerization transition, observed in our experiments. Second, HR-C unfolding would be independent of concentration in this model, also inconsistent with our data (Figure 7). Based on our data we propose a novel ‘dimer activation model’ (Figure 9B). In this model HR-C remains bound to HR-A/B in the unstressed Hsf1 monomer. However, unstressed Hsf1 could transiently dimerize due to the larger size of the HR-A/B region (75 amino acids) as compared to HR-C (42 amino acids). Such dimers would be destabilized by the interaction of HR-C with HR-A/B, resulting in high dissociation rates and a high fraction of Hsf1 monomers in unstressed cells. However, HR-A/B-HR-A/B interaction could also destabilize the interaction of HR-C with HR-A/B. At high Hsf1 concentrations, association of a third Hsf1 monomer to the transient Hsf1 dimer could occur, displacing the then more-weakly bound HR-C and leading to a stable Hsf1 trimer. Heat-induced unfolding of HR-C and possibly also its binding partner within HR-A/B (in our experiments obscured by subsequent trimerization) would lead to HR-C undocking. This would reduce Hsf1 dimer dissociation rates and favor Hsf1 trimerization even at low Hsf1 concentrations. In this model, HR-C unfolding and trimerization are kinetically coupled processes, at least for short heat shocks (up to 15 min), explaining why they occur at identical rate constants (Figure 4). Furthermore, the average energy to unfold a protein which does not contain a co-factor is 1.4 kJ·mol-1 (Privalov and Gill, 1988; Alexander et al., 1992). Dividing the activation energy for HR-C unfolding determined by us, 249 kJ·mol-1, by 1.4 results in 175, suggesting that 175 residues are involved in this unfolding process. This is close to 168, the number of residues corresponding to a dimer of the coiled-coil between HR-C (42 residues) with a similar sized region in HR-A/B. Our dimer activation model assumes that the proposed Hsf1 dimer has a lower Tm (Tm,D) than the Hsf1 monomer and that the measured Tm depends on the fraction of Hsf1 dimer present in the assay. We therefore plotted all of our Tm values derived for wild-type Hsf1 and incubation times of 10 min versus Hsf1 concentration and fitted the quadratic solution of the law of mass action for the monomer-dimer equilibrium to the data (Figure 9C). This fit results in a KD for the monomer-dimer equilibrium, the Tm,M for the monomer and the Tm,D for the dimer. However, the derived values are only very rough estimates due to the sensitivity of the curve to values of very low concentrations of Hsf1, which, for technical reasons, we could not determine so far. However, the steepness of the curve demonstrates that already small changes in concentration can dramatically change the transition temperature for Hsf1 activation. Although there are no concentration determinations for Hsf1 in different tissues available to our knowledge, using the relative quantification data determined by mass spectrometry for 11 different cancer cell lines (Geiger et al., 2012), and assuming that these cells have a total protein concentration of about 150 mg/ml as determined for HEK293 cells (Gillen and Forbush, 1999), results in Hsf1 concentrations between 10 and 130 nM. The resulting Tm values would be between 47 and 53°C. However, Hsf1 is not equally distributed throughout the cytosol but shuttles in and out of the nucleus with various stress conditions preventing Hsf1 export out of the nucleus (Vujanac et al., 2005), resulting in a locally increased Hsf1 concentration between 4- and 17-fold (Fujioka et al., 2006) and a local concentration between 40 and 2210 nM. This is well within the range that would lead to a functional heat shock response according to our model. Interestingly, the recent crystal structure of the trimerization domain of the Hsf1 homolog Skn7 of Chaetomium thermophilum contains trimers but also tetramers (PDB ID 5D5Z and 5D5Y, [Neudegger et al., 2016]). This tetramer might be a proxy for the dimer of HR-C-HR-A/B coiled-coils. To visualize how such an Hsf1 dimer might look like, we modeled the structure of HR-A, HR-B and HR-C using I-TASSER (Roy et al., 2010; Zhang, 2008; Yang and Zhang, 2015; Yang et al., 2015) and the tetramer structure of the trimerization domain of Skn7 as template (Figure 9D). Hsp90 could modulate the monomer-trimer transition by stabilizing HR-A-HR-A interactions and/or destabilize HR-A/B-HR-C interactions, resulting in a reduced dimer dissociation rate and an increased rate of trimerization at lower temperatures. Stabilization of the HR-A-HR-A dimer and concomitant destabilization of HR-A/B-HR-C interaction would automatically destabilize HR-C ,since single helices are not stabile in solution and only stabilized by interaction with other structural elements, leading to a reduced unfolding transition temperature. To distinguish between stabilization of HR-A-HR-A interaction and destabilization of HR-A/B-HR-C interactions we simulated the effect of Hsp90 on the Tm by varying the apparent KD for dimerization and/or the Tm,D of the dimer (see Figure 9C, dotted lines). With the current data available only changing the KD does not reduce the Tm sufficiently to fit the measured values. However, small changes in KD and Tm,D would give satisfying results. This would also explain the observation that Hsp90 reduced the Tm for HR-C unfolding significantly more than the Tm for trimerization. 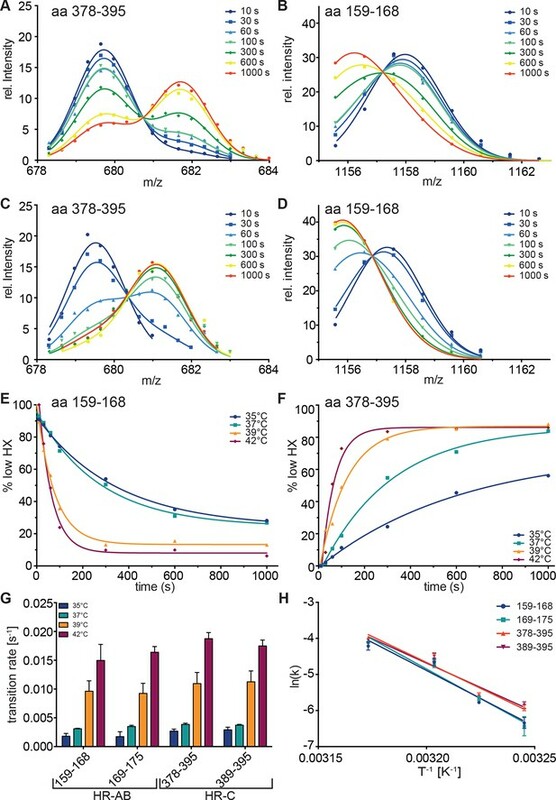 In this respect Hsp90, curiously, had a similar effect as the prolonged incubation at elevated temperatures (compare transition curves in Figure 2E and G and Figure 8B, C, and F). Thus, Hsp90 accelerates temperature-induced changes in conformation of Hsf1. It is not surprising that the chaperone Hsp90 destabilizes the HR-C conformation. Chaperones have been shown to locally unfold native proteins (Rodriguez et al., 2008; Sharma et al., 2010; Kirschke et al., 2014) and Hsp90 is believed to destabilize an α-helix in steroid hormone receptors to allow hormone binding. How could Hsf1 be active at non-heat stress conditions, for example during development (Xiao et al., 1999), and how could it be activated by salicylate, low pH, Ca2+ ions, hypoxia, or proteotoxic stress other than heat shock as demonstrated previously (Mosser et al., 1990; Jurivich et al., 1992; Huang et al., 1995; Liu et al., 1996; Zhong et al., 1999; Ahn and Thiele, 2003)? According to our model Hsf1 exists in a monomer-dimer equilibrium, and trimerization of Hsf1 with subsequent DNA binding may occur continuously at low levels, promoted by Hsp90, as shown by us, and inhibited by TriC/CCT (Neef et al., 2014). This may ensure basal Hsf1 transcriptional activity under non-stress conditions. At the same time inhibition of Hsf1 activity by Hsp90, Hsp70-mediated attenuation and continuous Hsf1 monomerization would keep heat shock gene transcription at a low level. Any condition that would favor Hsf1 dimerization and thus trimerization or inhibit chaperone-mediated inhibition or attenuation would, as a consequence, increase heat shock gene transcription. All of the conditions mentioned above, including development, have been associated with an imbalance in proteostasis affecting Hsf1 through titrating away chaperones. However, Hsf1 dimerization could also be affected directly by changing its local concentration, as through transport of Hsf1 into the nucleus (Dai et al., 2003) or preventing its export (Vujanac et al., 2005), and by posttranslational modifications, including glutathionylation of the cysteine in HR-A in response to oxidative stress or alkylating agents (Liu et al., 1996), and phosphorylation of Thr142 in HR-A (Soncin et al., 2003), both of which would reduce the positive net charge of HR-A and thus the electrostatic repulsion. Our model could explain why the temperature setpoint of activation was lower when human Hsf1 was expressed in Drosophila cells or in Xenopus oocytes (Baler et al., 1993; Clos et al., 1993). In transient or stable transfection experiments, usually a strong promoter is used to express the transfected gene. Thus, the concentration of Hsf1 might have been much higher in the transfected cell than is naturally the case in human cells. Similarly, in Xenopus oocyte-injection experiments the amount of injected mRNA determines the final concentration of HSF1 and might have been so high that the resulting Hsf1 concentration might have allowed activation already at 37°C. Finally, our kinetic Hsf1 activation model would allow each cell to adjust its setpoint of activation by changing the concentration of Hsf1 by producing more Hsf1 or by concentrating it in a smaller compartment, for example by transport from the cytoplasm into the nucleus. This would easily explain the different setpoints in testis (Sarge et al., 1995; Sarge, 1995), mouse T-lymphocytes (Gothard et al., 2003) and mouse motor neurons (Batulan et al., 2003). This might be particularly important for cancer cells for which it was shown that Hsf1 is a driver of malignancy (Dai et al., 2007). A culture of BL21 Rosetta, freshly transformed with a plasmid encoding the 6xHis-SUMO-Hsf1 wild-type or Hsf1-HR-A-S11 mutant sequence (Hsf1-I130S,V137S,L140S,V144S,M147S,M154S, L158S,M161S,L168S,V172S,L175S), was grown at 37°C to an OD600 of 0.6 and then shifted to 20°C. Expression was induced by addition of IPTG to a final concentration of 0.1 mM, the culture grown for 2 hr at 20°C and cells were subsequently harvested by centrifugation (4500 × g for 15 min). All following steps need to be carried out at 4°C. Cell pellets were resuspended in lysis buffer (25 mM Hepes pH 7.4, 150 mM NaCl and 10% glycerol, 3 mM β-mercaptoethanol) containing protease inhibitors (10 µg/ml aprotinin, 5 µg/ml leupeptin, 8 µg/ml pepstatin, one cOmplete Protease Inhibitor Cocktail tablet [Roche Diagnostics, Mannheim, Germany]). Cells were disrupted by subjecting the suspension two times to a chilled microfluidizer at a pressure of 1000 bar. The resulting lysate was immediately centrifuged (16000 × g for 45 min) to remove cell debris. The supernatant fraction containing 6xHis-tagged HSF1 was incubated for 20 min at 4°C with 1 g of Protino Ni2+-IDA resin (Macherey-Nagel, Düren, Germany) in a rotation shaker. The resin was transferred to an empty gravity-flow column and the flow-through was collected. In a first step the resin was washed with 10 column volumes (CV) of wash buffer and 10 CV of high salt buffer (25 mM Hepes pH 7.4, 1 M NaCl, 10% glycerol, 3 mM β-mercaptoethanol). After a final washing step with another 10 CV of wash buffer the protein was eluted by addition of 1.5 CV elution buffer (25 mM Hepes pH 7.4, 1 M NaCl, 10% glycerol, 3 mM β-mercaptoethanol, 250 mM imidazole) to the column. The SUMO-Tag was cleaved off by incubation with Ulp1 SUMO-protease for 2 hr at 4°C. The cleaved Hsf1 was further separated by size-exclusion on a S200 HiLoad 16/60 column (GE Healthcare Europe, Freiburg, Germany), equilibrated with Hsf1-buffer (25 mM Hepes pH 7.4, 150 mM NaCl, 10% glycerol, 2 mM DTT). The fractions containing monomeric Hsf1 were adjusted to a concentration of 10 µM, flash-frozen in liquid nitrogen and stored at -80°C. 300 nM Hsf1 premixed with 200 nM Cy3–labeled HSE-oligonucleotide were incubated for 10 min either on ice or at 42°C. As a positive control purified trimeric Hsf1 was kept on ice for 10 min. After incubation the samples were kept at room temperature for additional 30 min, mixed with glycerol and loaded onto a pre-chilled 1% agarose gel (TBE) at 4°C. The agarose gel was run for 30 min at 150 V in the cold room. Labeled HSE-DNA was detected on a FUJI LAS-4000 fluorescence imager (Fuji Photo Film, Düsseldorf, Germany). For Hsp90 experiments, 5 µM Hsf1 was premixed with 2.5 µM Cy3–labeled HSE-oligonucleotide and 20 µM Hsp90β in buffer containing 10 mM ATP/20 mM MgCl2. Samples were incubated for 10 min at different temperatures (20°C–42°C), diluted 1:6 in Hsf1-buffer and incubated for 30 min at room temperature. An amount of sample containing 850 nM Hsf1, 3.4 µM Hsp90β and 425 nM HSE-DNA was loaded onto a 1% agarose gel and processed as described above. For the determination of the temperature response curve of Hsf1 activation, 5 µM Hsf1 or mutants (S303D or S307D) in Hsf1-buffer (25 mM Hepes pH 7.4, 150 mM NaCl, 10% glycerol, 2 mM DTT) were heat shocked for 10 or 30 min at different temperatures (20°C–42°C). The samples were then diluted 1:20 in D2O buffer and incubated for 30 s at 20°C. Deuterated samples were quenched 1:1 with ice-cold quench buffer (400 mM sodium phosphate pH 2.2), quickly injected into the injection valve and subjected to LC-MS using an Agilent UPLC and a MaXis mass spectrometer (Bruker, Bremen, Germany). For each experiment at least one unexchanged sample and one fully deuterated control was measured. To determine the Hsf1 activation temperature at lower concentrations, Hsf1 was diluted to a concentration of 2 µM before the experiment. For HX-MS experiments in the presence of Hsp90β, 10 µM Hsf1 were mixed 1:1 with 40 µM human Hsp90β in reaction buffer (25 mM Hepes, 150 mM NaCl, 10% Glycerol, 20 mM MgCl2, 10 mM ATP and 2 mM DTT) and incubated for 10 min at 20°C. Equilibrated samples were then transferred to a thermomixer for a 10 min-incubation at seven different temperatures (20°C–42°C). Dilution in D2O buffer and subsequent steps were performed as described above. The unexchanged protein sample was diluted 1:20 in H2O buffer and then mixed 1:1 with quench buffer. The fully deuterated sample (protein in Hsf1-buffer containing 6 M guanidine hydrochloride, lyophilised and redissolved in pure D2O at least three times) was treated equally to normal samples. Data analysis was performed manually (Data Analysis 4.1, Bruker). 5 µM HSF1 in Hsf1-buffer were heat-shocked for different amounts of time (10 s, 30 s, 60 s, 100 s, 300 s, 600 s, 1000 s) at four different temperatures (35°C, 37°C, 39°C, 42°C). The samples were then diluted 1:20 in D2O buffer and incubated for 30 s at 20°C. Deuterated samples were quenched 1:1 with ice-cold quench buffer (400 mM sodium phosphate pH 2.2) and quickly injected into the injection valve and subjected to LC-MS. For each experiment at least one unexchanged sample and one fully deuterated control was measured. with A1/2 being the area of the two peaks; μ, the m/z values; μ1/2¯, the means of the Gaussian peaks, representing the centroid of each of the two subpopulations; and σ, the standard deviation of the Gaussian peaks, representing the width of the isotope peak distribution (see Figure 2—figure supplement 2B and D for individual Gaussian curves, the sum of which results in the fit curves of Figure 2). For each peptide showing a bimodal distribution all intensity values belonging to one temperature (Figures 2,3,5,7,8) or time (Figure 4) series was globally fitted assuming that σ, μ1 and μ2 are constant within this series. Independent experiments were treated independently. Then the parameters of the fit results, A1/2, μ1/2¯ and σ, were used to calculate for each individual isotope peak which part of the intensity belongs to the low exchanging subpopulation and which part belongs to the high exchanging subpopulation (see Figure 2—figure supplement 2A and C panels: calculated intensity values for low [blue] and high [red] exchanging subpopulations for each isotope peak stacked on top of each other for comparison with original spectra). For all isotope peaks the intensities belonging to one subpopulation (low or high) was summed up to calculate the fraction of this subpopulation within the sample. with f0 and fmax being the fraction of high exchanging subpopulation at low and high temperatures, respectively; T, absolute temperature in K; Tm, temperature at midpoint of activation; R, gas constant; ∆H, unfolding enthalpy. Hsf1 (10 µM) in Hsf1-buffer were incubated for 30 min at 0°C (control) or 42°C (heat shock). Natively purified dimer and trimer of Hsf1 were added as additional controls. After incubation 7 µg of Hsf1 were loaded on a 7% native gel or a 4–16% native gradient gel and separated by blue native polyacrylamide gel electrophoresis as described in (Wittig et al., 2006) except that Coomassie Brillant Blue G250 was only present in the sample buffer (0.2%) not in the running buffer. For western blot analysis, an anti-Hsf1 antibody was used (Santa Cruz Biotech, HSF1 H-311). Aliquots of Hsf1 were thawed and immediately centrifuged (4°C, 15 min, 15000 rpm). In order to capture any occurring trimeric Hsf1, the supernatant was incubated for 20 min on ice with DNA containing three HSEs coupled to magnetic beads (5’-CCCCTTCCCGAATATTCCCCC-3’, 0.5 mg per aliquot, Dynabeads M-280 by Invitrogen). The supernatant concentration was determined by absorbance at 280 nm. Subsequently, four discrete concentrations of Hsf1 (5 µM, 1 µM, 300 nM, 100 nM) were prepared with Hsf1-buffer and heat-shocked for 10 min at five different temperatures (30°C, 35°C, 37°C, 39°C and 42°C) using a temperature-controlled water bath. Additionally, 300 nM Hsf1 was kept on ice for the same period of time as a control. Fluorescence anisotropy measurements were performed with a CLARIOstar microplate reader (BMG Labtech) and 384-well black flat-bottom microplates (Corning) in a final sample volume of 30 µL. Samples were serial diluted 1:2 until concentrations were below 1 nM. 10 nM of Alexa Fluor 488-labelled DNA containing three HSEs (5’-[A488]CCCCTTCCCGAATATTCCCCC-3’ (Sigma-Aldrich) was added by the injection system of the plate reader to start the measurement. Molecular and Cellular Biology 18:4949–4960. Annual Review of Biochemistry 80:1089–1115. Molecular and Cellular Biology 13:2486–2496. The Journal of Neuroscience 23:5789–5798. Molecular and Cellular Biology 35:2530–2540. Journal of Biological Chemistry 273:18974–18978. Journal of Biological Chemistry 281:8917–8926. The American Journal of Physiology 276:C328–336. Journal of Biological Chemistry 278:9322–9326. Microbiology and Molecular Biology Reviews 72:545–554. Journal of Biological Chemistry 276:45791–45799. Molecular and Cellular Biology 23:2953–2968. Proceedings of the National Academy of Sciences of the United States of America 103:45–50. Journal of the National Cancer Institute 92:1564–1572. Journal of Biological Chemistry 280:12653–12657. Biochemical and Biophysical Research Communications 430:1109–1113. The Journal of Biological Chemistry 271:4805–4812. Proceedings of the National Academy of Sciences of the United States of America 87:3748–3752. Nature Structural & Molecular Biology 23:140–146. Proceedings of the National Academy of Sciences of the United States of America 108:14204–14209. Advances in Protein Chemistry 39:191–234. Journal of Biological Chemistry 281:16493–16501. Molecular and Cellular Biology 13:1392–1407. Journal of Biological Chemistry 270:18745–18748. Biochemical and Biophysical Research Communications 303:700–706. Cell Stress & Chaperones 9:122–133. Journal of Biological Chemistry 281:782–791. Current Cancer Drug Targets 3:349–358. Proceedings of the National Academy of Sciences of the United States of America 111:18297–18302. Journal of Biological Chemistry 273:8749–8755. Journal of Biological Chemistry 272:4094–4102. Journal of Biological Chemistry 274:3135–3140. Molecular and Cellular Biology 14:7557–7568. Molecular and Cellular Biology 15:4319–4330. Thank you for submitting your work entitled "Molecular mechanism of thermosensory function of human heat shock transcription factor Hsf1" for consideration by eLife. Your article has been reviewed by four peer reviewers, one of whom is a member of eLife Board of Reviewing Editors, and the process has been overseen by Michael Marletta as the Senior Editor. The merit of this paper is deemed to rest in the novel application of HDX to probe changes in the structure of mammalian HSF1 under different temperature and concentration conditions. Its key conclusion is that a temperature-induced change in the folded state of domain HR-C set in motion a chain of events that culminates in trimerisation and DNA binding. Thereby establishing a direct thermal sensing by HSF1 in its activation. 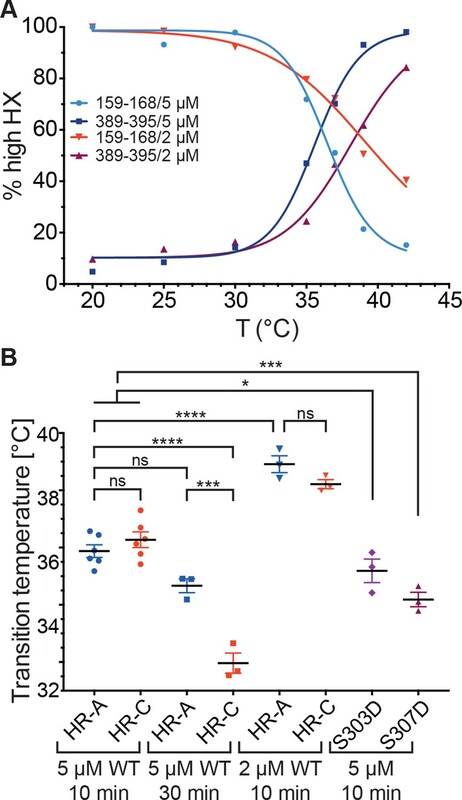 Quantification of the temperature-dependence and concentration-dependence of changes in the folded state of HR-C and HR-AB provides fodder for plausible modeling of the effects of HSF1 concentration on its temperature-dependent activation profile (i.e. the driver of the heatshock response in mammals) and uncovered a surprising effect of Hsp90 on this dynamic process. 1) Most of the experiments are based on H/D exchange. They reveal changes in local dynamics and accessibility depending on temperature variation. It is reasonable to assume that the defined changes identified by the authors are the critical changes that promote trimerization. However, as a proof of principle one would like to see an assay that reports directly on quaternary structure performed in parallel to some of the H/D experiments. Phrased differently, the kinetic data requires validation studies to correlate the changes observed in HX correlate with acquisition of HSF1 trimers and DNA binding activity. 2) The authors show in Figure 1C that monomeric Hsf1 forms trimers upon incubation at 42 degrees for 10 min, but did the authors also check what happens in the temperature range they used for HDX i.e. 30-45 degrees (the temperature region where a decrease in HX in HR-A/B is observed as shown in Figure 2D)? 3) The effect of Hsp90 observed vitro is a major surprise. The scope and significance of the paper would be expanded by learning if a reference chaperone (e.g. the Hsp70 system) has a similar effect. 4) While the authors present the baseline HX-MS data for control HSF1, the baseline data for fully activated HSF1would provider the reader with a sense of the dynamic range of the assay (i.e., the experimental results use 10 min exposures to the various temperatures but what are the HX-MS data for recombinant HSF1 exposed for prolonged times). 5) In fluorescence anisotropy experiments, the authors fitted all curves to the same equation assuming identical KD values. However, for example, at 30 and 37/39/42 degrees, the shape of the red curve (5000 nM) appears different. At 30 degrees it is exponential while at 37/39/42 degrees, it is sigmoidal. Moreover, Hsf1 was incubated at different concentrations at different temperatures to enable trimer formation and later serially diluted. Did authors check whether the initial trimerization state of Hsf1 obtained during incubation at different temperatures is maintained upon serial dilutions? 6) The authors fitted the temperature response curves in the HDX experiments to the thermal equilibrium unfolding two state equation. An important parameter for the equilibrium unfolding fit is the reversibility of the reaction. Did authors check whether Hsf1 thermal unfolding is reversible? This paper presents a detailed characterization of the response of purified HSF1 to temperature changes as reflected in the HDX profile, oligomeric status, DNA binding affinity and the modulatory effect of Hsp90b on the latter parameter. The findings seem largely to corroborate the previously held views regarding the role of interactions between the C-terminal domain and the trimerisation domain of Hsf1 in repressing trimerisation and blocking inactivation. With temperature relieving the block. The main surprise here is the effect of Hsp90, which is proven to lower the temperature threshold for trimerisation and attenuate the cooperativity observed in the transition from the repressed monomeric state to the active DNA-binding competent trimeric state. However this surprising result is not elaborated upon mechanistically nor is its significance to cell physiology explained. The main merit of the paper thus lies in the significance of the application of HDX to this question and in the benefit to science from the carefully reasoned discussion of the quantitative parameters measured. This is a rather subjective matter best answered by experts in the field who can place the paper in context. The concordance between enhanced exchange of the HR-C peptide and the reduced exchange of the HR-AB peptide (Figure 2D and F) is consistent with the "thermosensor" being embodied in the transition between a state in which the two domains interact and the state in which HR-AB is trimeric and HR-C exposed to the solvent. It is thus unclear why the authors chose to describe the event as "unfolding" of the HR-C domain, for it seems to be equally relevant to describe it as unfolding of the HR-AB domain followed by its trimerisation. Can these two events be unlinked by mutagenesis: Are there mutations that preserve the AB-C interaction but block trimerisation; these might be predicted to promote temperature dependent enhanced exchange in both the AB and C regions? The effect of Hsp90 on the HDX reactions (Figure 6A and B) has been carried out on the intact Hsf1. The apparent cooperativity between the effect of temperature on HDX by HR-AB and H-C limits the ability of these experiments to discriminate between the mechanisms proposed in Figure 7. But mutagenesis of Hsf1 has the potential to isolate the effects of Hsp90 to interactions with one domain or the other. Has this been tried? Following melting of the AB-C (intramolecular) complex, oligomerisation competes with complex re-formation. Hence the concentration dependence of the relationship between Hsf1 concentration and the thermal sensing profile. Is it possible to model this relationship to predict the differences in Hsf1 needed to explain tissue-specific (testis versus other tissues) and heterologous cell type expression effects on temperature sensing? Are the predicted differences in Hsf1 concentration reasonable? The manuscript by Hentze et al. deals with a longstanding discussion on the mechanism of activation the heat shock transcription factor-1 (HSF1). The dogma in the field has been for long that the monomeric HSF-1 is kept inactive by chaperones (HSP90 and more recently also TRiC) until a proteotoxic stress occurs that titrates these chaperones to misfolded proteins, allowing HSF-1 to form trimers, the required step for it to activate the heat shock response (HSR). Even though generally cited, this model – or at least the generality of it – has been repeatedly questioned and the negative regulation by Hsp90 might likely be indirect. In this paper, direct evidence is provided that HSF1 itself undergoes heat-induced conformational changes that would suffice to explain heat-induced HSF1 activation, confirming earlier suggestions that HSF-1 in fact acts as the thermosensor. Using recombinant HSF1 in vitro and hydrogen exchange MS (HX-MS) the authors show that two domains in HSF1 undergo temperature-induced conformational changes: 1) the HR-C in the transactivation domain shows increased HX (unfolding and thermosensor) followed by 2) the HR-A/B domain in the trimerization domain that shows decreased HX (consistent with trimer formation), indicating that the HR-C region is the thermosensor. Next, they show that HSF-1 concentration is an important parameter for the trimerization as well as for the DNA-binding competence of the trimer, which would be consistent with the possibility that HSF1 activation is different between species and cell types through adjustment of HSF-1 concentration. Phosphorylation mimicking mutants of two serines (S303 and S307), which affect HSF-1 activity in cells, did not significantly affect these transition temperatures, meaning that these phosphorylations are not crucial for thermosensing. 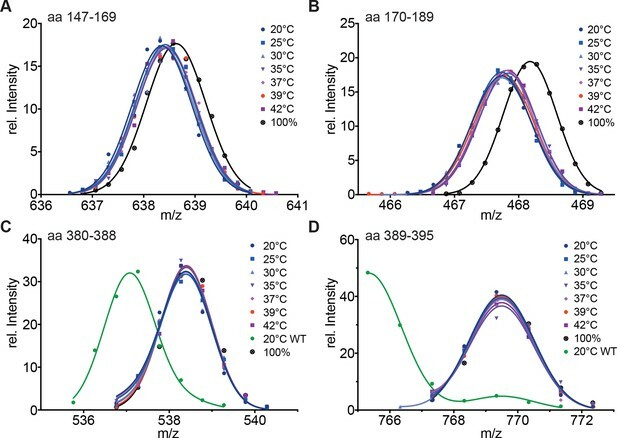 Most intriguingly, also the addition of HSP90 to HSF-1 did not increase (but rather decreased) the transition temperature, implying that HSP90 is not a negative regulator of the thermosensing activity of HSF1. Hsp90 addition did broaden the transition temperature window, indicating that it does influence HSF1 activity. Overall, the data are convincing and highly intriguing. The idea that the HR-C motif is crucial to HSF-1 trimerization and DNA binding (via intramolecular interactions with the HR-A/B domain) is not novel as also very correctly cited by the authors themselves. But, especially for the human HSF-1, the finding that it is the temperature sensing domain was never directly demonstrated before. The finding that Hsp90 is not inhibiting trimerization is the most surprising finding and challenges a long-lived dogma in the field. As stated again correctly by the authors themselves, it cannot be excluded that in vivo co-chaperones may still play a role, but this will have now to be shown in separate studies. 1) Whereas the data clearly demonstrate that Hsp90 (alone) does not negatively regulate HSF-1, I am somewhat puzzled the fin dings that HSP90 lowers the threshold temperature for HR-C unfolding. Also in both models presented in Figure 7, this does not become clear. Whilst in the dimer activation model, the effects of HSP90 on HR-A/B might be explained by assuming stabilization of the intermediate dimer, I do not understand how such would explain effects on HR-C unfolding. I further would like to add that I find Figure 7 and the related explanation (Discussion, fourth paragraph) not very clear in general. 2) Whilst the data strongly suggest HSF-1 as thermosensor and thus the main driver activation of the heat shock response at elevated temperature, HSF-1 can also be activated at physiological temperatures by various forms of proteotoxic stress. 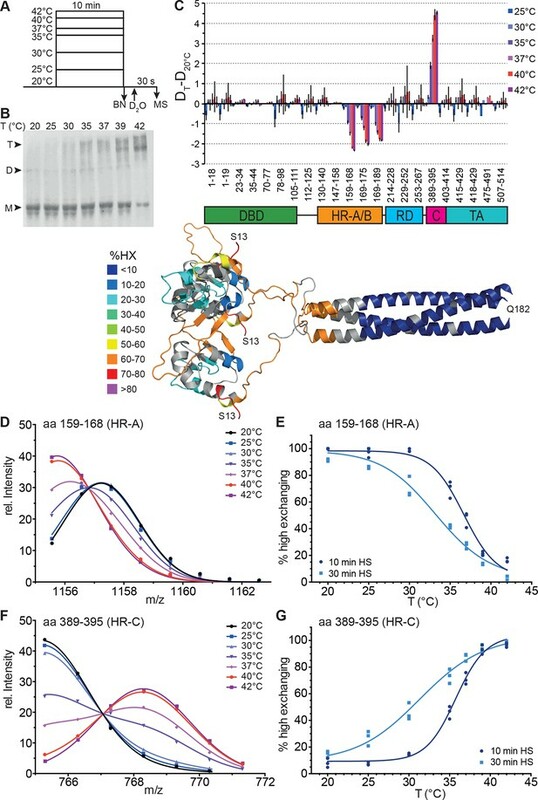 The existing model of negative regulation by Hsp90 or TRiC explained this by a shift of the chaperones from HSF-1 binding to binding to the stress-unfolded proteins. Can the authors speculate how they would interpret that data with their model and findings that Hsp90 does not negatively regulate HSF-1 activation? This manuscript addresses an important aspect of the regulation of the heat shock repsonse. In eukaryotic cells, the trimerization of the transcription factor Hsf1 is important for its activation. This process is affected by the molecular chaperones Hsp70 and Hsp90. The authors make excellent use of H/D exchange technology to obtain new insight on the underlying temperature-induced processes which finally lead to trimerization, including the influence of phosphorylation of Hsf1 and Hsp90 on the transition temperature of this process. Some technical issues need to be addressed. 1) Most of the experiments are based on H/D exchange. They reveal changes in local dynamics and accessibility depending on temperature variation. It is reasonable to assume that the defined changes identified by the authors are the critical changes that promote dimerization. However, as a proof of principle one would like to see an assay that reports directly on quaternary structure performed in parallel to some of the H/D experiments. This may also provide interesting information on the coordination of these events. 3) In Figure 2B no significant changes are observed in deuterium incorporation in the DBD at all the temperatures tested. I expected to see some changes in the DBD because trimerization of Hsf1 induces DNA binding and hence should cause certain conformational changes in the DBD to enable it to bind to DNA. 4) In fluorescence anisotropy experiments, the authors fitted all curves to the same equation assuming identical KD values. However, for example, at 30 and 37/39/42 degrees, the shape of the red curve (5000 nM) appears different. At 30 degrees it is exponential while at 37/39/42 degrees, it is sigmoidal. Moreover, Hsf1 was incubated at different concentrations at different temperatures to enable trimer formation and later serially diluted. Did authors check whether the initial trimerization state of Hsf1 obtained during incubation at different temperatures is maintained upon serial dilutions? Error bars should be shown in Figure 4. 5) In Figure 1C,a band is obtained at a size larger than the trimer. Does that mean that higher ordered oligomers are formed instead of trimers? 7) H/D exchange is temperature-dependent: the higher the temperature, the faster the exchange. In the experiments, Hsf1 was incubated at different temperatures and then diluted 1:20 at 20 degrees. The authors may want to add control experiments in which they show whether pre-incubation influences the exchange. 8) MS/MS spectra of the two peptides AA[159-168] and AA[389-395] discussed intensively could be added to a supplement. Furthermore, it may be useful to show difference plots for the effect of Hsp90 (similar to Figure 2B) at two different temperatures. 1) Isolating monomeric, activatable HSF1 is challenging. The authors argue they have accomplished this feat. As this reagent is key to all of the presented findings it is imperative that is well characterized. The basic model is that monomeric HSF1 will not bind DNA but heat stress will induce trimerization and a DNA binding activity. Yet, in Figure 1D there is clear DNA binding by what is supposed to be monomeric HSF1 since in lane 2 it has not been exposed to elevated temperature. Is this DNA binding resulting from spontaneous trimerization of their HSF1 or is monomeric HSF1 binding DNA? The authors should determine if HSF1 is trimerizing under their control conditions by incorporating a crosslinker and then probing for trimeric species of HSF1 by western blot analysis. The presence of some trimeric HSF1 under control conditions is reasonable; however, the relative levels need to be determined and the presence of this species in their HX-MS studies needs to be considered. 2) While the authors present the baseline HX-MS data for control HSF1, the baseline data for fully activated HSF1 should also be given (i.e., the experimental results use 10 min exposures to the various temperatures but what are the HX-MS data for recombinant HSF1 exposed for prolonged times). Showing HX-MS data from equilibrated trimeric HSF1 will help in assessing the presenting kinetic activation data (Figure 3). In addition, the kinetic data requires validation studies to show that the changes they observe in HX correlate with acquisition of HSF1 trimers and DNA binding activity, which could be accomplished by including crosslinking and EMSA analysis of HSF1 exposed to similar conditions. 3) The authors present a potentially interesting concept that HSF1 concentration might influence its temperature activation properties (Figure 4). Given the novelty of this concept, in vivo data correlating with the in vitro work should be presented. For example, is HSF1 much more abundant in testis where its activation temperature is lower relative to other tissue types? Do all tissues with high levels of HSF1 display lower HSF1 activation responses? In addition, how do the shown concentrations of HSF1 compare to in vivo levels in any tissue type under normal or disease states? Changes in HSF1 concentrations in cancer cells would be especially interesting in light of the recent reports from the Lindquist laboratory showing constitutively active HSF1 in cancer cells. 4) The data generated with the phosphomimic mutants in Figure 5B are interesting. However, given the sensitivity of HX-MS it is quite possible that the amino acid substitutions are causing pleotropic effects. Hence, this work would require an assessment of actual phosphorylated HSF1 in order to be substantiated. 5) The work with Hsp90 is also intriguing. However, is this a general chaperone effect or is it specific to Hsp90? Would Hsp70 have a compare impact on the HX-MS data? While the following is a bit outside the scope of this work, if we assume Hsp70 does impact HSF1 and given the authors focus on identifying factors that influence the HSF1 temperature set point, would the testis-specific Hsp70 have a distinct impact on HSF1 structural transitions relative to the more broadly expressed Hsp70s? […] The reviewers have provided a wealth of suggestions as to how further improvements to the manuscript might be made and the authors are advised to look these over carefully (the unedited comments follow). But the consultation process has flagged the following as issues that must be addressed in the revised manuscript before acceptance. These issues were singled out for your attention because they are deemed to affect the strength of the papers conclusions: 1) Most of the experiments are based on H/D exchange. They reveal changes in local dynamics and accessibility depending on temperature variation. It is reasonable to assume that the defined changes identified by the authors are the critical changes that promote trimerization. However, as a proof of principle one would like to see an assay that reports directly on quaternary structure performed in parallel to some of the H/D experiments. Phrased differently, the kinetic data requires validation studies to correlate the changes observed in HX correlate with acquisition of HSF1 trimers and DNA binding activity. The reviewers are correct that our HX-MS data require validation by other methods that report on quaternary structure. 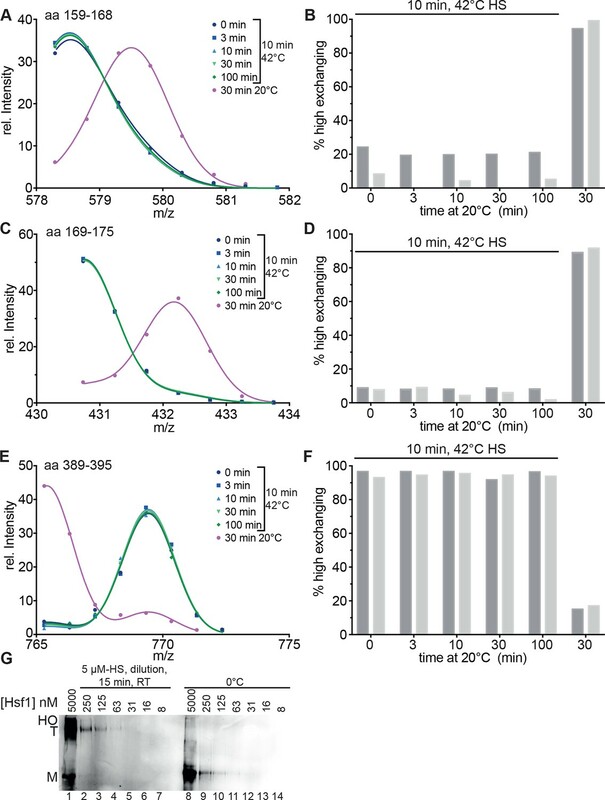 For this reason we already had in the previous manuscript a blue native polyacrylamide gel showing that heating Hsf1 for 10 min at 42°C leads to a slower migrating band of trimeric Hsf1 (Figure 1C). We also showed electrophoretic mobility shift assays (EMSA) reporting on DNA binding, which increased dramatically after heating to 42°C (Figure 1D). It has been shown before that monomeric Hsf1 has a very low affinity to its cognate DNA motif and needs to trimerize to detect DNA binding by EMSA (Baler et al., 1993). We also showed in the previous manuscript a temperature response curve for Hsf1 measured by EMSA (Figure 6C). We agree that this control is rather late in the manuscript but we wanted to show these data next to the temperature response curve for Hsf1 in the presence of Hsp90β to allow immediate comparison. In the revised manuscript we have now included a new temperature response curve for Hsf1 followed by blue native polyacrylamide gel electrophoresis, reporting directly on the change in quaternary structure in response to pre-incubation at different temperatures (new Figure 2B and Figure 2—figure supplement 1). We would like to thank the editor for waving this point. As explained in a letter to the editor, extending our study performed with Hsp90 to another chaperone (e.g. Hsp70), is much more complex than the reviewers seem to realize. First, addition of another protein in HX-MS experiments requires a new establishment of the analysis. Since the chaperone is added in several fold excess and, depending on the digestion efficiency of the chaperone itself, peptides will overlap with Hsf1 peptides, the liquid chromatography gradient has to be adjusted to be able to separate the relevant peptides. Second, to give meaningful results Hsp70 should not be used alone but should be used in combination with one of the some 16 J-domain co-chaperones predicted to be present in the cytosol of human cells and maybe one of the seven nucleotide exchange factors. At present we have no idea which of the J-domain proteins and which of the nucleotide exchange factors is relevant for Hsf1 regulation. Also, should the heat-inducible Hsp70 or the constitutive Hsc70 be used in such a study? We think this is a completely new study that will be interesting but in our opinion goes far beyond the current manuscript. Besides, Hsp70 was shown not to affect activation of Hsf1 but attenuation (Rabindran et al. 1994 Mol Cell. Biol). I am not sure how such a study would impact our results with Hsp90. If Hsp70 has a similar effect or not, will not substantiate our findings with Hsp90. Already in the previously submitted manuscript we provided data on Hsf1 pre-incubation at four different temperatures for extended times (previous Figure 3, now Figure 4). We have now followed the reviewers’ suggestion and determined temperature response curves with 30 min pre-incubation at the different temperature. As already suggested by our previous kinetic data, the transition midpoint temperature for trimerization decreased albeit only slightly from 36.15 to 34.7°C. Interestingly, the transition curves for 30 min incubation were less steep and the unfolding transition for HR-C was significantly lower at 32°C. These data are now included in Figure 2E and G and are discussed. 5) In fluorescence anisotropy experiments, the authors fitted all curves to the same equation assuming identical KD values. However, for example, at 30 and 37/39/42 degrees, the shape of the red curve (5000 nM) appears different. At 30 degrees it is exponential while at 37/39/42 degrees, it is sigmoidal. All data points of all concentrations and all temperatures were globally fitted together with the quadratic solution of the law of mass action, keeping the KD, lower and upper anisotropy limits constant for all data, resulting in sigmoidal curves on a logarithmic scale. Therefore, the 30°C curve only appears exponential but is in reality part of a sigmoidal curve. The global fit was necessary since, as the reviewers observe correctly, at some temperatures not enough trimeric Hsf1 is generated to saturate DNA-binding and reach the upper limit of the anisotropy values and therefore the upper limit is not defined for these temperatures. Fitting the data individually would not yield a KD or upper limit. But assuming that complete binding of the DNA always results in the same anisotropy value, the saturation data of the higher temperature series can be used to define the upper limit of the sigmoidal curve for the lower temperature series. Moreover, Hsf1 was incubated at different concentrations at different temperatures to enable trimer formation and later serially diluted. Did authors check whether the initial trimerization state of Hsf1 obtained during incubation at different temperatures is maintained upon serial dilutions? “To investigate this [reversibility of trimerization] in more detail we heat shocked Hsf1 for 10 min at 42°C, then incubated the protein for different time intervals at 20°C, and analyzed the conformational state by HX-MS (Figure 3). […] Therefore, we cannot derive the unfolding enthalpy ∆HU from our temperature response data but only use the fit to determine the temperature at which 50% of the transition occurred. Of note, the analyzed peptides occurred in different charge states, the relative intensities of which varied between experiments. We always analyzed and show the charge state with the highest intensity, which gives the most accurate result. For this reason the m/z scales for identical peptides may differ in different figures. We only point this out to avoid confusion. Reviewer #1: This paper presents a detailed characterization of the response of purified HSF1 to temperature changes as reflected in the HDX profile, oligomeric status, DNA binding affinity and the modulatory effect of Hsp90b on the latter parameter. The findings seem largely to corroborate the previously held views regarding the role of interactions between the C-terminal domain and the trimerisation domain of Hsf1 in repressing trimerisation and blocking inactivation. With temperature relieving the block. We would like to point out that the molecular mechanism of Hsf1 trimerization that we show in our study and illustrate in previous Figure 6B (now Figure 8B) is very different from previous models. Since unfolding of HR-C depends on the concentration of HSF1, as we demonstrate in our study, the simple model proposed by Wu and colleagues cannot be operative. In such a model the relief of the repressive function of HR-C on Hsf1 trimerization would not depend on the concentration of Hsf1. There might have been before circumstantial evidence for a concentration dependence of Hsf1 activation but the mechanistic implications of such incidental observations have not been realized. As the reviewer might realize, providing mechanistic insights into this phenomenon and giving cell physiological explanations is far from trivial and requires a new study, which we will undertake as soon as possible. The concordance between enhanced exchange of the HR-C peptide and the reduced exchange of the HR-AB peptide (Figure 2D and F) is consistent with the "thermosensor" being embodied in the transition between a state in which the two domains interact and the state in which HR-AB is trimeric and HR-C exposed to the solvent. It is thus unclear why the authors chose to describe the event as "unfolding" of the HR-C domain, for it seems to be equally relevant to describe it as unfolding of the HR-AB domain followed by its trimerisation. Can these two events be unlinked by mutagenesis: Are there mutations that preserve the AB-C interaction but block trimerisation; these might be predicted to promote temperature dependent enhanced exchange in both the AB and C regions? The reviewer raises a very interesting point. To our knowledge all described variants of Hsf1 that do not trimerize anymore have a deleted HR-A and/or HR-B (Zuo et al. 1994) and as such would not be useful for the suggested experiment. Based on published data on Hsf1-deletion mutants (Zuo et al. 1994) and our HX-MS results showing strong protection in HR-B, suggesting interaction of HR-C with HR-B, we tried to construct a suitable mutant by exchanging hydrophobic residues of the heptad repeat region A, which was proposed to be responsible for the formation of a trimeric coiled-coil and was shown recently to form the trimer interface, by serine. In HX-MS experiments both regions, HR-A and HR-C, were completely exchanged after 10 min pre-incubation at all temperatures tested, indicating that the mutated residues are necessary for the interaction of HR-A with HR-C and for trimerization. Unfortunately, our data do not provide any indication where Hsp90 interacts with Hsf1. This might be due to an incomplete sequence coverage in the presence of the excess of Hsp90, which leads to overloading certain regions of the mass spectra preventing evaluation of a number of Hsf1 derived peptides. In the absence of any information on the interacting domain, mutagenesis would be pure guesswork and has not been undertaken so far. Our dimer activation model assumes that the proposed Hsf1 dimer has a lower Tm (Tm,D) than the Hsf1 monomer and that the measured Tm depends on the fraction of Hsf1 dimer present in the assay. […] This is well within the range that would lead to a functional heat shock response according to our model. Reviewer #2: Overall, the data are convincing and highly intriguing. The idea that the HR-C motif is crucial to HSF-1 trimerization and DNA binding (via intramolecular interactions with the HR-A/B domain) is not novel as also very correctly cited by the authors themselves. But, especially for the human HSF-1, the finding that it is the temperature sensing domain was never directly demonstrated before. The finding that Hsp90 is not inhibiting trimerization is the most surprising finding and challenges a long-lived dogma in the field. As stated again correctly by the authors themselves, it cannot be excluded that in vivo co-chaperones may still play a role, but this will have now to be shown in separate studies. My question/comments that the authors may wish to consider are: 1) Whereas the data clearly demonstrate that Hsp90 (alone) does not negatively regulate HSF-1, I am somewhat puzzled the fin dings that HSP90 lowers the threshold temperature for HR-C unfolding. Also in both models presented in Figure 7, this does not become clear. Whilst in the dimer activation model, the effects of HSP90 on HR-A/B might be explained by assuming stabilization of the intermediate dimer, I do not understand how such would explain effects on HR-C unfolding. I further would like to add that I find Figure 7 and the related explanation (Discussion, fourth paragraph) not very clear in general. We have restructured and rewritten this part to make it clearer. We also included additional information based on published data and the recent crystal structure of the trimerization domain of Chaetomium thermophilum Skn7, supporting our novel model of HSF1 activation. We have performed the requested control experiments analyzing Hsf1 after pre-incubation at different temperatures by blue native gel electrophoresis with similar results (new Figure 2B and Figure 2—figure supplement 1). Please also see above, major point 1. This has been done (new Figure 2B and Figure 2—figure supplement 1). A conformational change in the DNA binding domain is not necessary. The isolated DNA binding domain is also able to bind to DNA, albeit with low affinity. According to Kim et al. 1994 the KD for binding of the isolated DNA binding domain of Drosophila Hsf1 to the cognate motif nGAAn is 2.2 µM at physiological salt concentrations (150 mM KCl) and 4°C and is actually increasing with increasing temperature (up to 18°C tested). After trimerization the KD for binding to the consensus heat shock element (nTTCnnGAAnnTTCn) is expected to be much lower (in our experiments the KD is 1 nM) due to the increased avidity. Of note, intrinsic hydrogen exchange rates are of course higher at higher temperatures and proteins tend to exchange protons more rapidly at higher temperatures due to increased conformational dynamics. However, all incubations in D2O were performed at 20°C. Since we did not observe significant changes in protection in the DNA binding domain, conformational changes in the DNA binding domain potentially induced by the pre-incubation at elevated temperatures seem to be completely reversible in contrast to the changes induced in HR-A/B and HR-C.
We did this control experiment, displayed in new Figure 3G. Error bars should be shown in Figure 4. We added the error bars to previous Figure 4 now Figure 6. 5) In a Figure 1C, band is obtained at a size larger than the trimer. Does that mean that higher ordered oligomers are formed instead of trimers? As mentioned in the text, higher order oligomers are formed in addition to trimers. However, upon dilution this band disappears suggesting that the higher order oligomers dissociate (see Figure 3G). We did check for reversibility and had already stated in the original manuscript that trimerization was not reversible in our hands. We have now added more quantitative data on this. We heat shocked Hsf1 for 10 min at 42°C, then incubated the sample for various time intervals at 20°C, before analyzing the conformation of Hsf1 by HX-MS (included as new Figure 3A–F). We also state this clearly in the manuscript. We used the unfolding fits only for determining the Tm for the given conditions. We do not derive the unfolding enthalpy or heat capacity of the protein. This is now stated more clearly in the manuscript. The equilibrium unfolding equation fits the data reasonably well with residuals generally smaller than the deviations between biological replicates and no systematic deviation detectable. Therefore, we decided to use this equation instead of a generic three-parameter sigmoidal equation. I am not quite sure what the reviewer wants to point out with this comment. The purpose of this study was to detect conformational change induced by pre-incubation of Hsf1 at elevated temperatures. To exclude the effect of temperature on the intrinsic exchange kinetics as well as on the dynamics of the protein all HX-experiments were performed at 20°C. In preceding experiments we have also performed HX with Hsf1 at higher temperatures and observed the increase in exchange kinetics expected. Now we also added the control experiment to show that the induced conformational changes do not revert back during an incubation at 20°C for 3 to 100 min (Figure 3). We now show MS/MS spectra for the most important peptides (Figure 2—figure supplement 4) and we added the difference blot of deuteron incorporation into Hsf1 in the presence of Hsp90 minus the deuteron incorporation of Hsf1 in the absence of Hsp90 (new Figure 8A) for all temperatures measured. Reviewer #4: The authors provide a potentially very interesting manuscript describing how Heat Shock Factor 1 might serve as a thermosensor for transducing a heat-stress signal in cells along with a role for the Hsp90 molecular chaperone in broadening the temperature response range of HSF1. They use an elegant biophysical approach (hydrogen-deuterium exchange coupled with mass spectrometry (HX-MS)) to delineate the polypeptide areas of HSF1 that are sensitive to temperature changes. Their work identifies a region that unfolds with temperature (HSF1 regulatory region) and an area that concomitantly tightens (trimerization region). The relative structural transitions in these regions in response to temperature are relatively sharp especially compared to the behavior in the presence of Hsp90, which broadens the structural transitions. In addition, the authors present data suggesting phosphorylation might also impact the responsiveness of HSF1 to temperature. In considering the work for publication the following points should be weighed: 1) Isolating monomeric, activatable HSF1 is challenging. The authors argue they have accomplished this feat. As this reagent is key to all of the presented findings it is imperative that is well characterized. The basic model is that monomeric HSF1 will not bind DNA but heat stress will induce trimerization and a DNA binding activity. Yet, in Figure 1D there is clear DNA binding by what is supposed to be monomeric HSF1 since in lane 2 it has not been exposed to elevated temperature. Is this DNA binding resulting from spontaneous trimerization of their HSF1 or is monomeric HSF1 binding DNA? The reviewer is correct, there is some DNA binding observed in the monomer preparation of Hsf1. We discovered that freezing and thawing leads to spontaneous trimerization of monomeric Hsf1. We therefore used in many experiments HSE-DNA coupled to magnetic beats to fish out any trimerized Hsf1. In all HX-MS experiments the amount of trimeric Hsf1 was too small to be detected as long as Hsf1 was incubated on ice. The authors should determine if HSF1 is trimerizing under their control conditions by incorporating a crosslinker and then probing for trimeric species of HSF1 by western blot analysis. Instead of using a crosslinking assay, which is not quantitative, we used blue native gel electrophoresis to determine trimeric and monomeric DNA and also to demonstrate that incubation at elevated temperature increases the amount of trimeric Hsf1 now shown in Figure 2B. Also, Figure 3G lane 8 shows that our Hsf1 preparation used for experiments contains practically no detectable trimeric Hsf1. As mentioned the amount of trimeric Hsf1 in HX-MS experiment was so low that it had no impact on the determination of the temperature response curves. Assuming that the fraction of low exchanging species detected for peptides 159-168 and 169-175 of region HR-A/B detected at 20°C corresponds to the amount of trimeric Hsf1 present in the preparation then its concentration was less than 10% (Figure 2E). Similarly, the amount of high exchanging species for peptides of region HR-C, potentially corresponding to present trimer, was below 10% (Figure 2G). 2) While the authors present the baseline HX-MS data for control HSF1, the baseline data for fully activated HSF1 should also be given (i.e., the experimental results use 10 min exposures to the various temperatures but what are the HX-MS data for recombinant HSF1 exposed for prolonged times). Showing HX-MS data from equilibrated trimeric HSF1 will help in assessing the presenting kinetic activation data (Figure 3). We now provide HX-MS data with prolonged pre-incubation of Hsf1 at the different temperatures (included in Figure 2E and G; and Figure 2—figure supplement 3). In addition, the kinetic data requires validation studies to show that the changes they observe in HX correlate with acquisition of HSF1 trimers and DNA binding activity, which could be accomplished by including crosslinking and EMSA analysis of HSF1 exposed to similar conditions. The reviewer might have overlooked it, but in previous Figure 6C (now Figure 8C) we show an EMSA analysis of the temperature dependent activation of Hsf1 in absence and presence of Hsp90, which were performed exactly as the HX-MS experiments in other parts of the study, yielding within experimental error identical results. We also present now a temperature transition curve from blue native gel electrophoretic analysis of the quaternary state of Hsf1 (new Figure 2B and new Figure 2—figure supplement 1). As the reviewer states, the physiological relevance of our findings needs to be investigated. We have carefully screened the literature. The concentration of Hsf1 in testis has not been determined nor in any other tissue. The only values that we could find are a relative quantification of the complete proteome of 11 cancer cell lines performed by mass spectrometry in the Mann laboratory (Geiger et al. 2012). From these values we were able to calculate the fraction that Hsf1 makes up relative to all proteins detected. However, the value for cellular protein concentration is not trivial to determine, because for this one needs the volume of the cells. In many reviews values of 200 to 300 mg/ml are given, most of the time without any reference and if a reference is given, then it is another review without reference. We screened the literature extensively and found for HEK293 and Jurkat cells a protein concentration of 154 and 127 mg/ml (Gillen and Forbush 1999; Fumarolo et al. 2005). In the revised manuscript we include now some estimations of Hsf1 concentration in mammalian cells based on these values. However, Hsf1 is not evenly distributed in the cells but shuttles in and out of the nucleus (Vujanec et al. 2005). It becomes clear that what this reviewer asks is not trivial and requires a careful study to come to trustworthy conclusions. We will try to address this question in the future. This reviewer certainly has a valid point that phosphomimetic amino acid substitutions may not reflect the real situation. She/he is probable also aware of the fact that protein phosphorylation in vitro is usually performed using radiolabeled [γ-32P]ATP because the efficiency of in vitro phosphorylation is not very high, to say the least. For HX-MS experiments we would need phosphorylation levels of >90%. This is not achievable. It would certainly be interesting to compare the influence of Hsp90 on Hsf1 with the influence of Hsp70. However, this is not as trivial as the reviewer might think and involves a completely new study. First, addition of another protein in HX-MS experiments requires a new establishment of the analysis. Since the chaperone is added in several fold excess and, depending on the digestion efficiency of the chaperone, peptides will overlap with Hsf1 peptides, the liquid chromatography gradient has to be adjusted to be able to separate the relevant peptides. Second, Hsp70 cannot be used alone but should be used in combination with one of the some 16 J-domain co-chaperones predicted to be present in the cytosol of human cells and maybe one of the seven-nucleotide exchange factors. At present we have no idea which of the J-domain protein and which of the nucleotide exchange factor is relevant for Hsf1 regulation. Also, should the heat inducible Hsp70 or the constitutive Hsc70 be used in such a study. This is a completely new study. Besides, Hsp70 was shown not to affect activation of Hsf1 but attenuation (Rabindran et al., 1994 Mol Cell. Biol). This would certainly be an interesting new study. We thank A Bracher for kindly providing the trimer model of Hsf1. We thank Stephan Hennes for excellent technical assistance and Thomas Ruppert for support in the Core Facility for Mass Spectrometry and Proteomics of the ZMBH (SFB 1036/Z1). © 2016, Hentze et al.